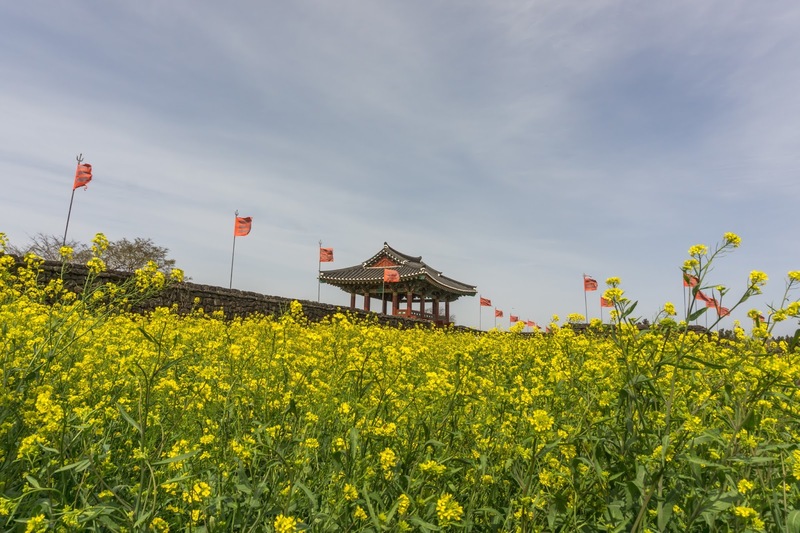 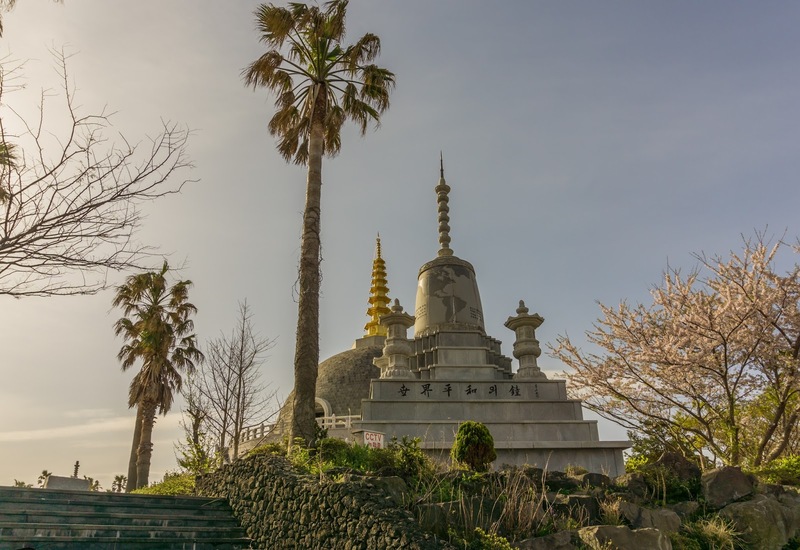 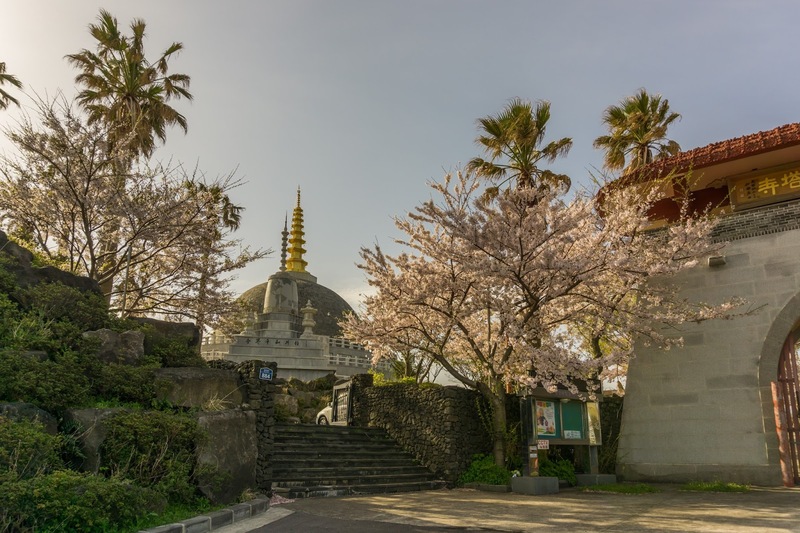 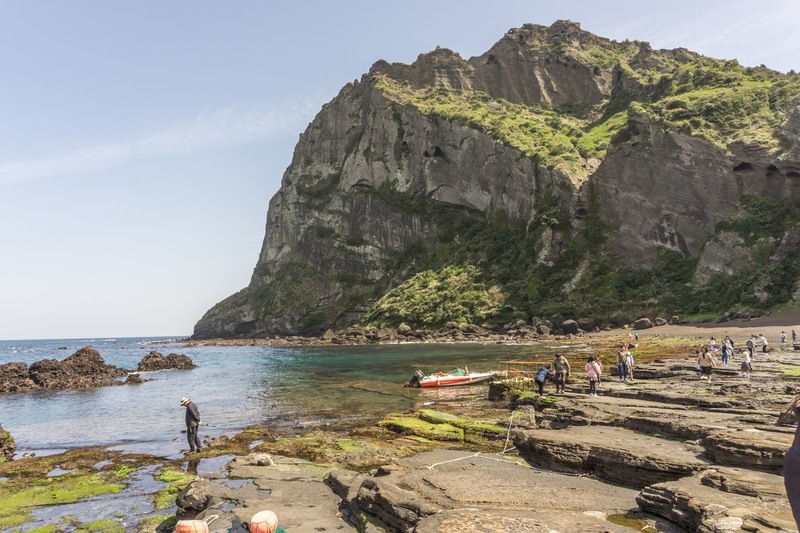 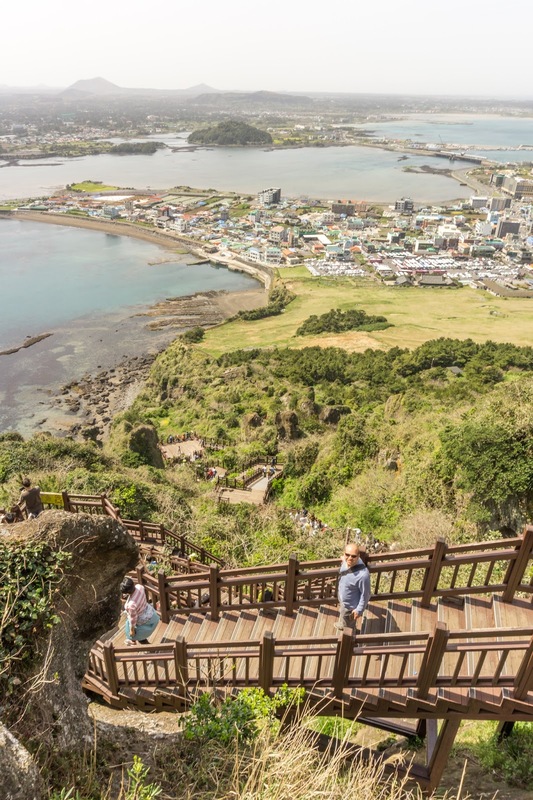 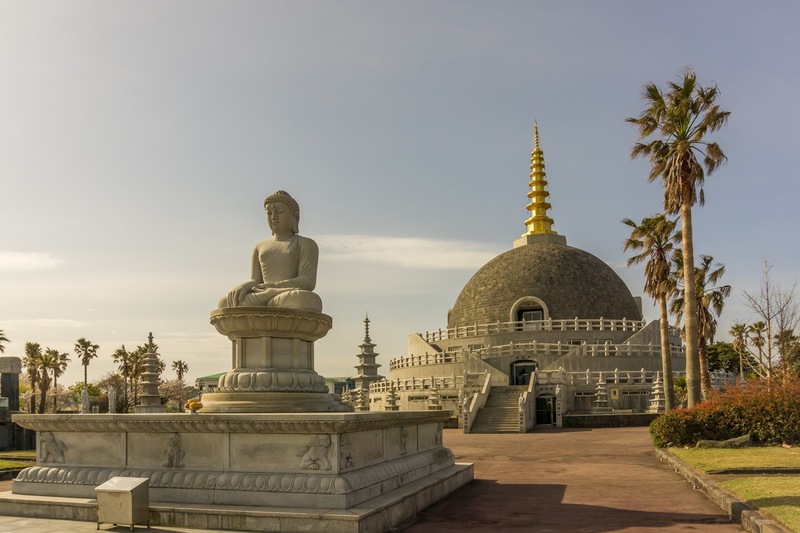 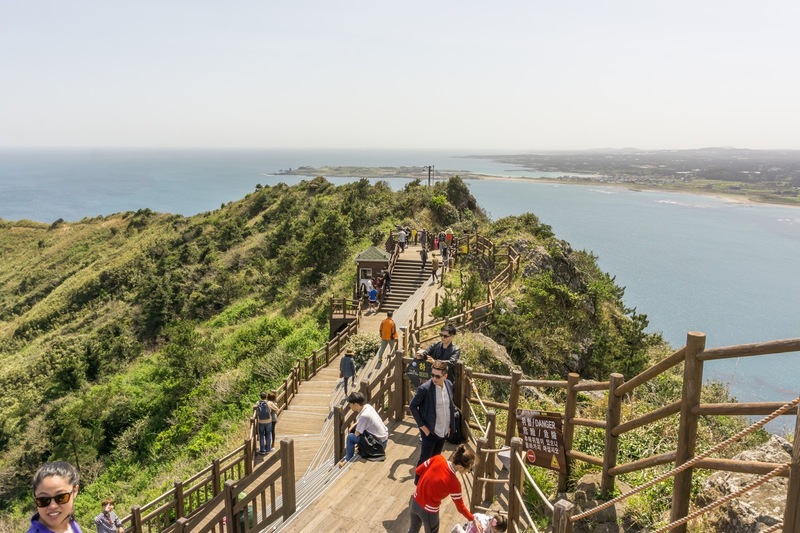 Jeju Island is rather large, and there are so many attractions, that you could spend a week to visit them. 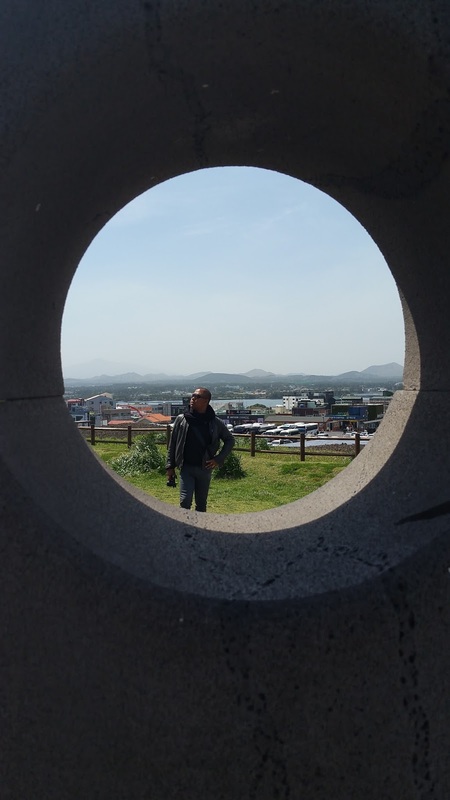 Unfortunately, we only had a day left for sightseeing in Jeju. 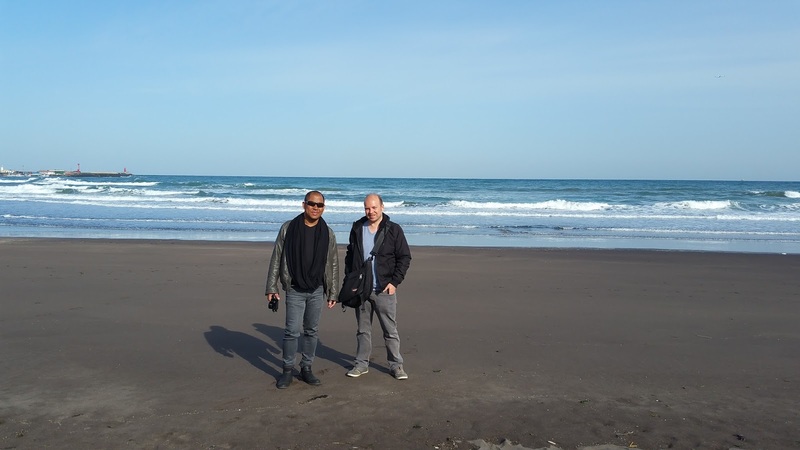 But we had booked already a driver for the day to make the most of it. 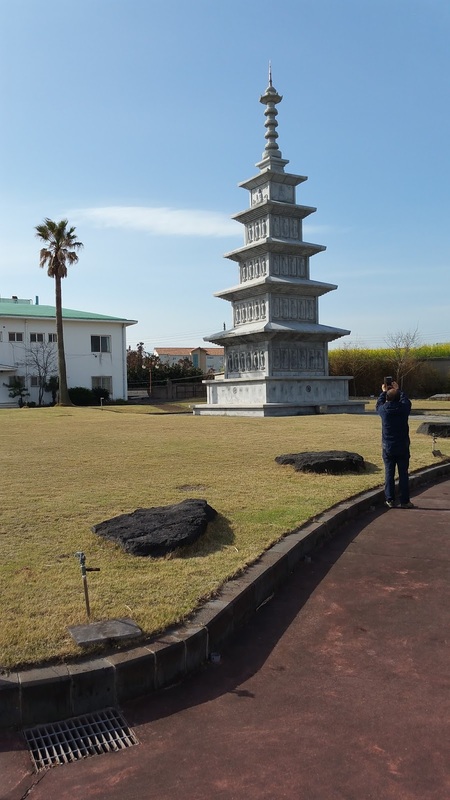 Our driver from Jeju Day Tour arrived right on time in the morning at our hotel, the Ellui Hotel Jeju, and then we had eight hours to see some of Jeju's attractions. 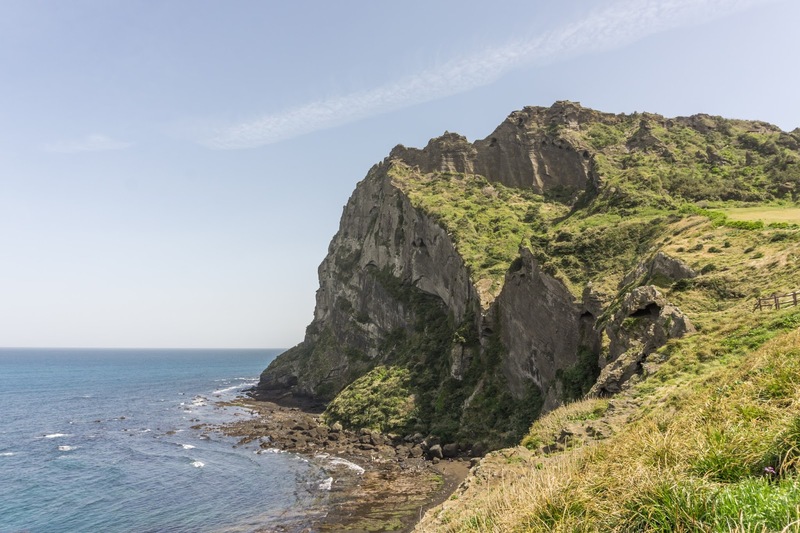 We showed the driver the itinerary of the sights we picked to see that day and soon were at the first shortstop at the Samyang Black Sand Beach. 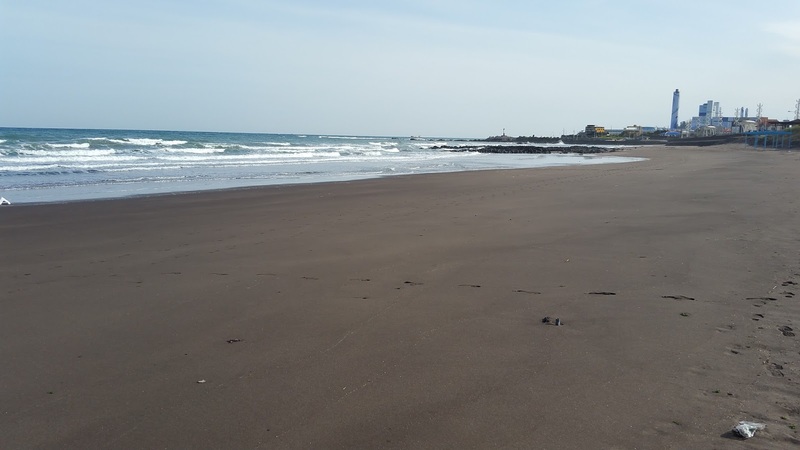 It was too cold to swim, but we just wanted to take a look, after seeing black sand beaches in Santo Domingo, Philippines, and Vik, Iceland. 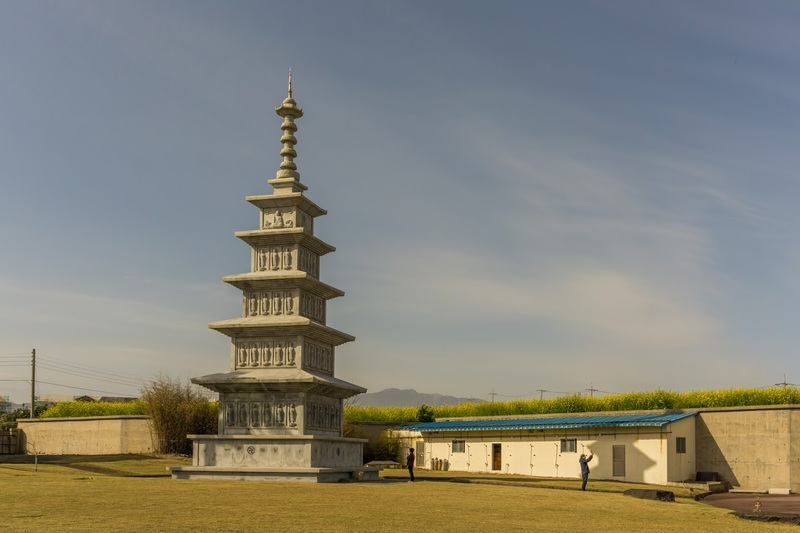 We had seen online, that there is a unique temple on the way and therefore stopped next at the Bulsari Tapsa Temple. 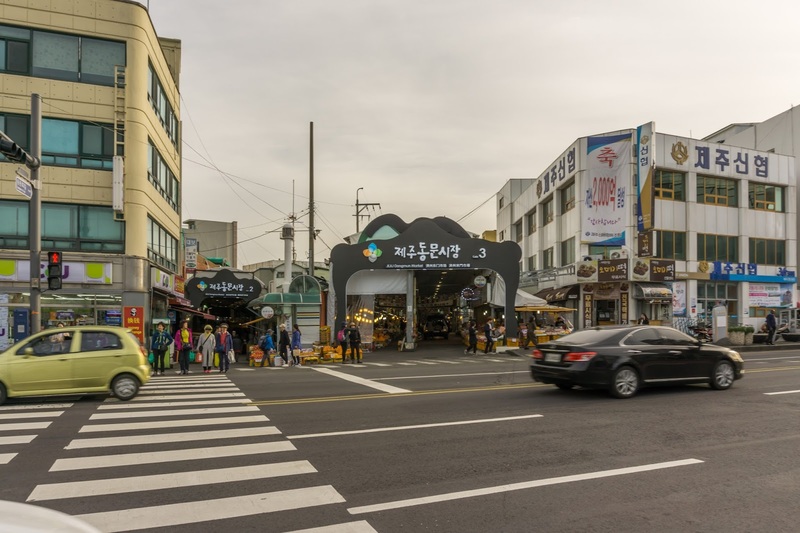 We walked around the area, and it is a great stopover. 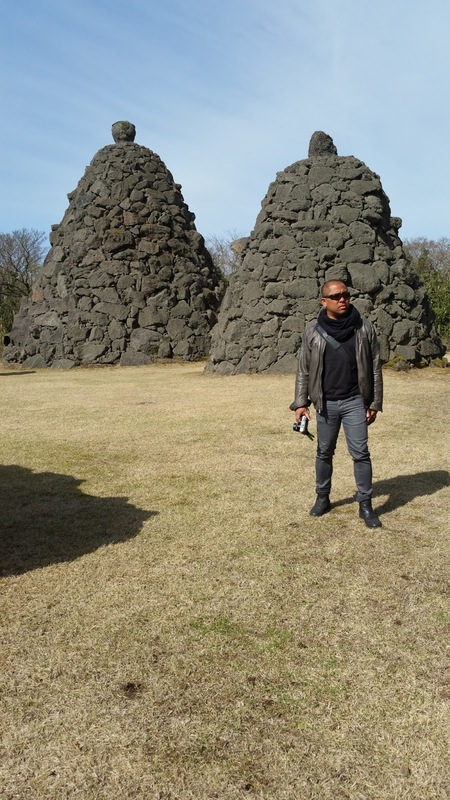 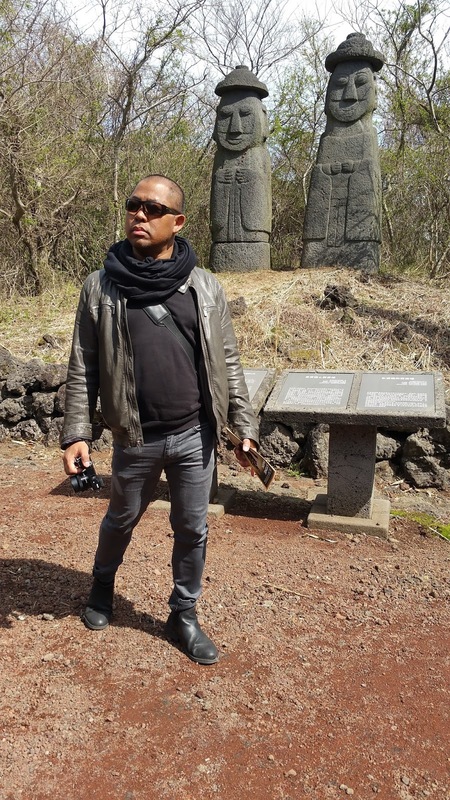 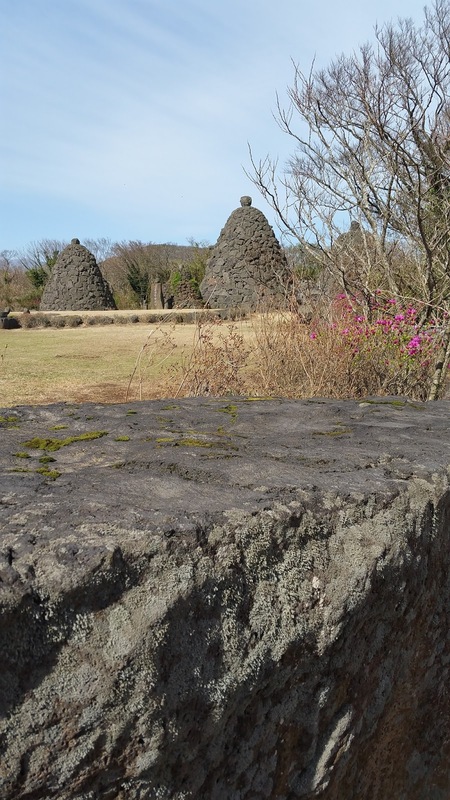 Eventually, we came to the Jeju Stone Park. 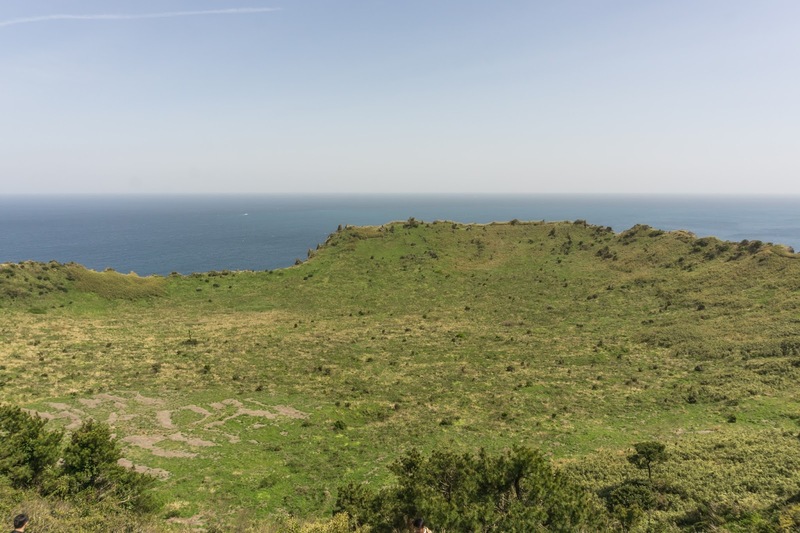 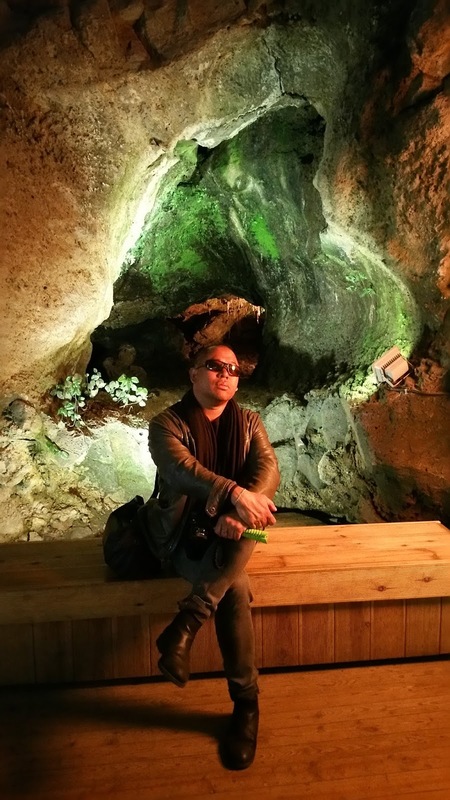 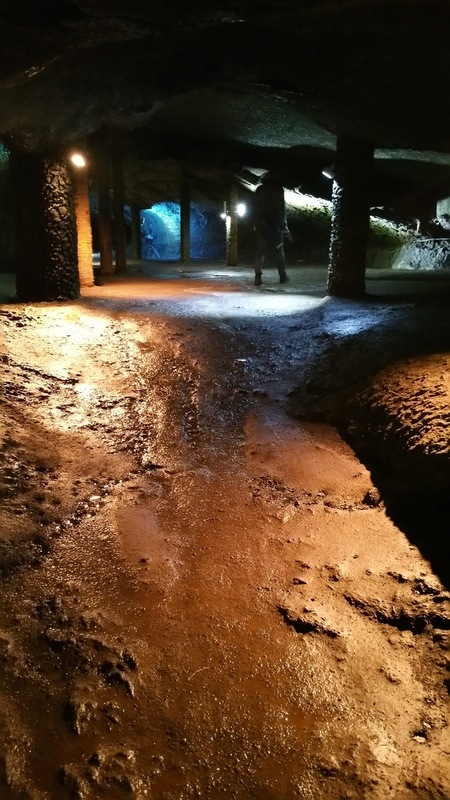 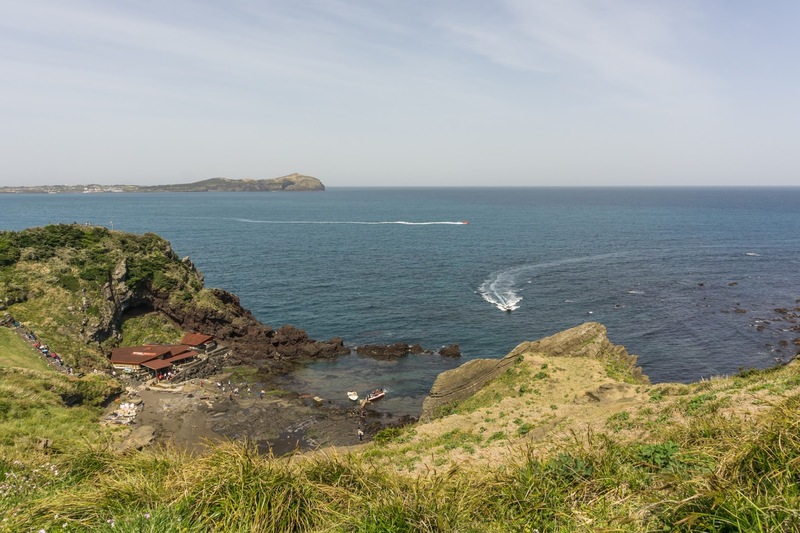 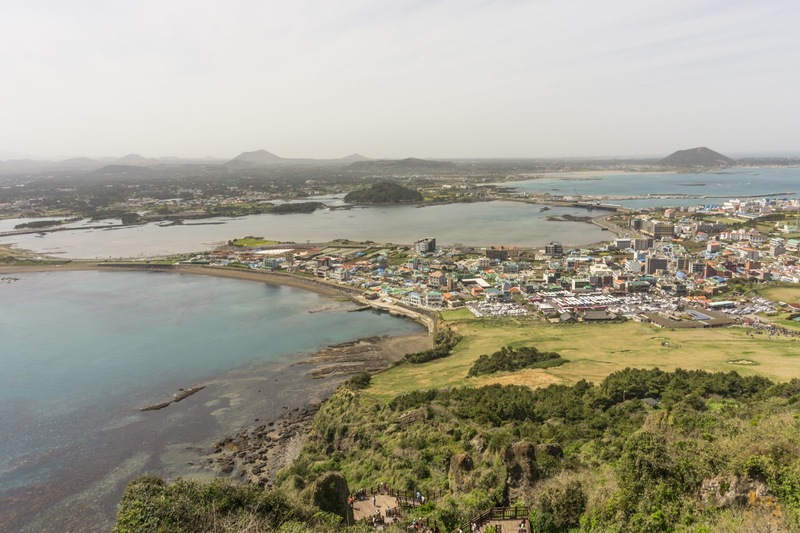 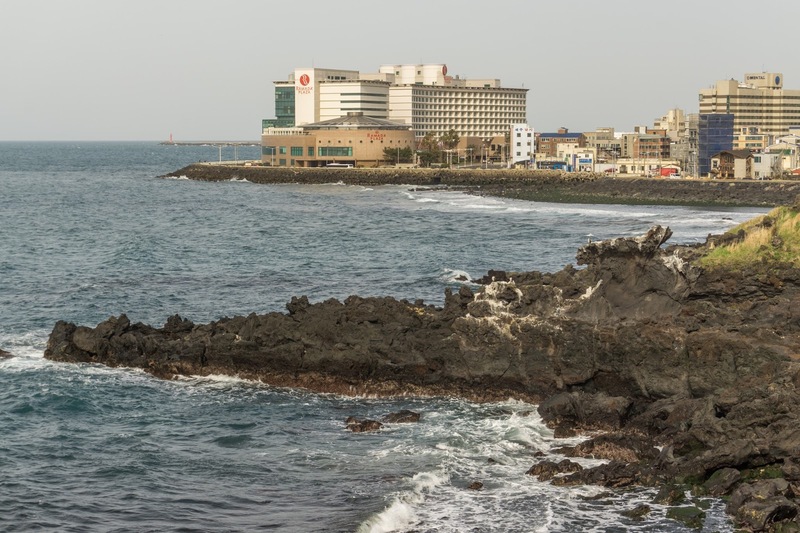 Jeju is a volcanic island, and we wanted to see more of that. 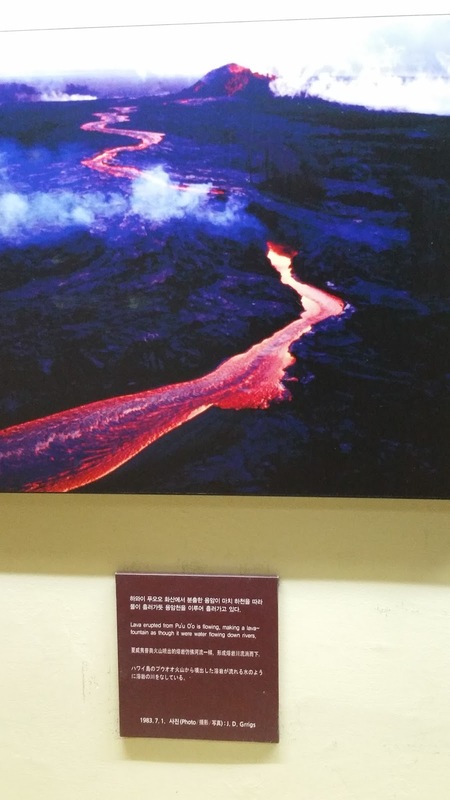 After all, it's also a UNESCO World Heritage Site. 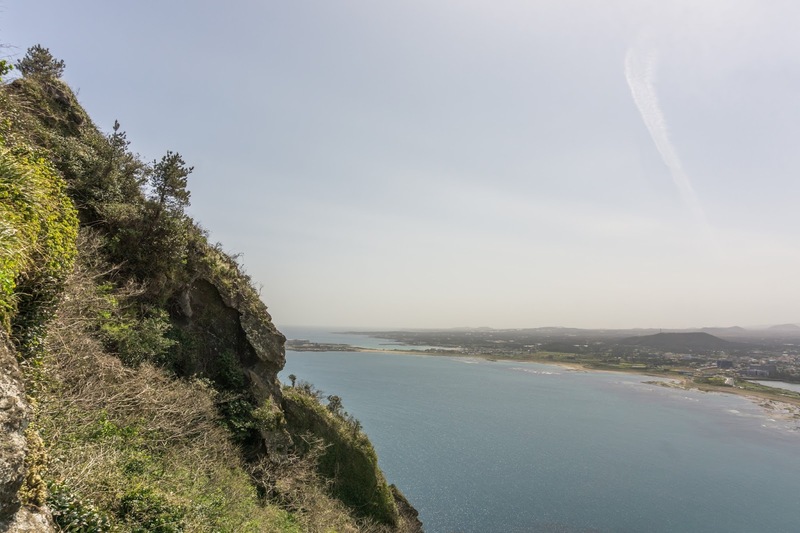 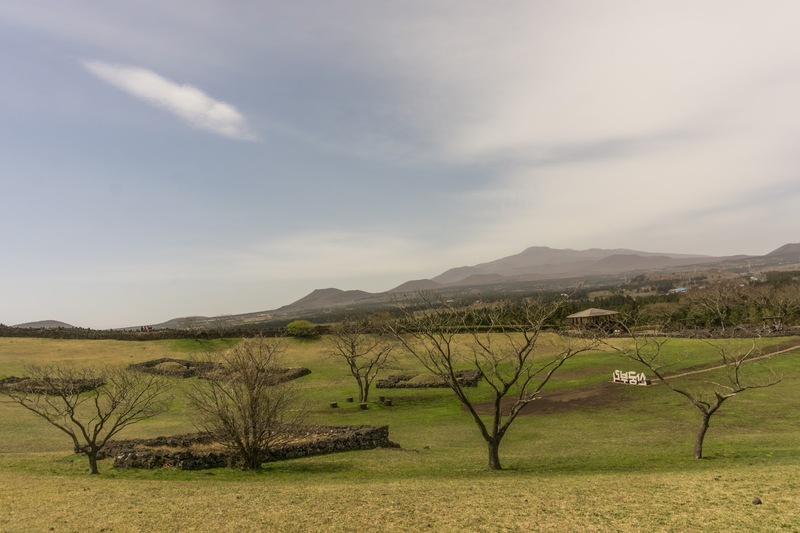 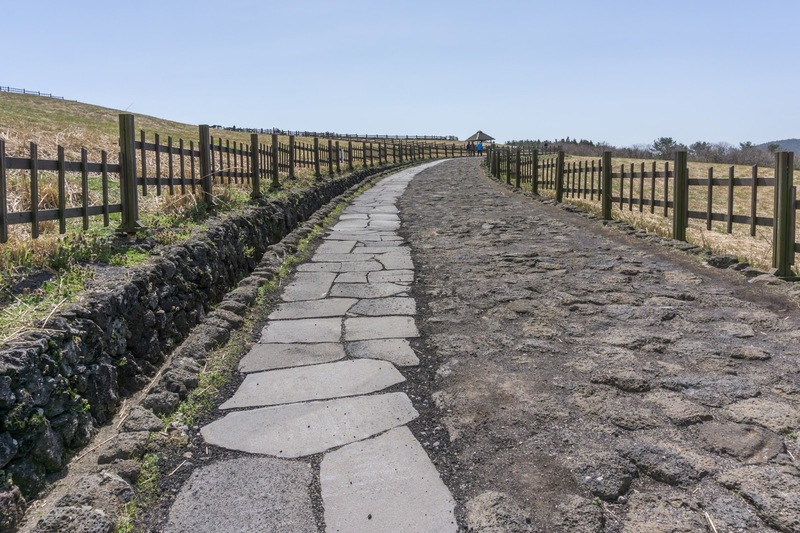 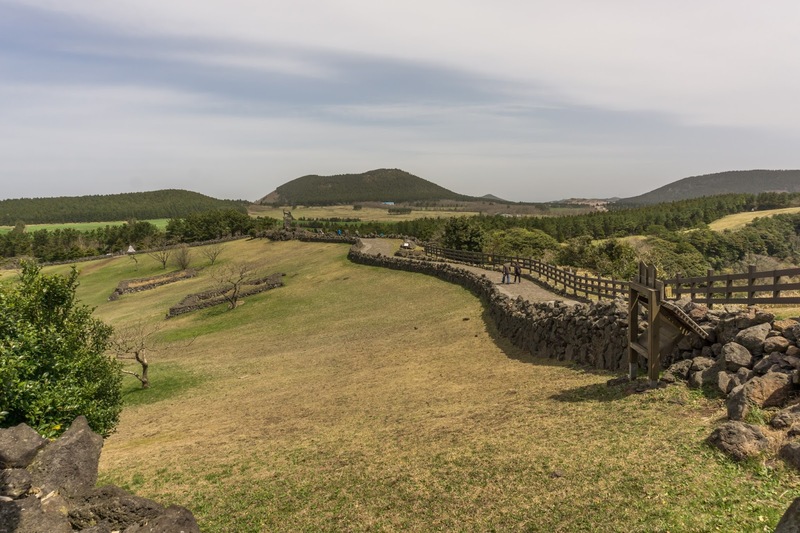 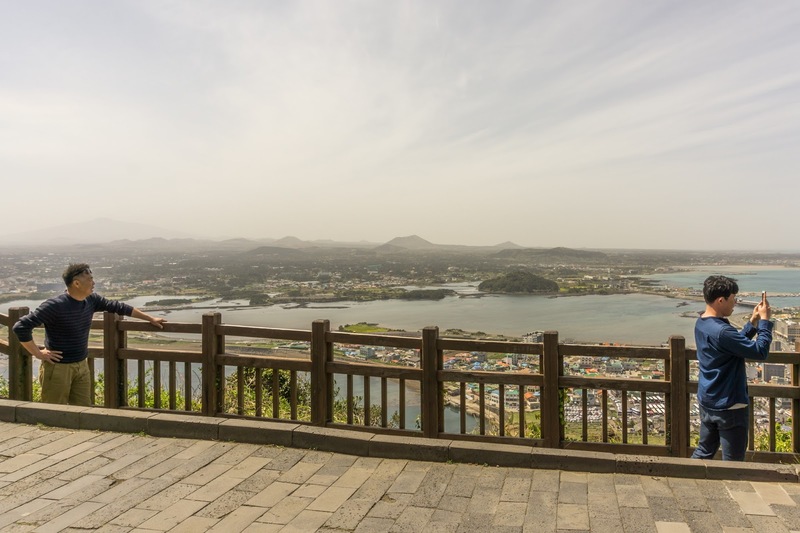 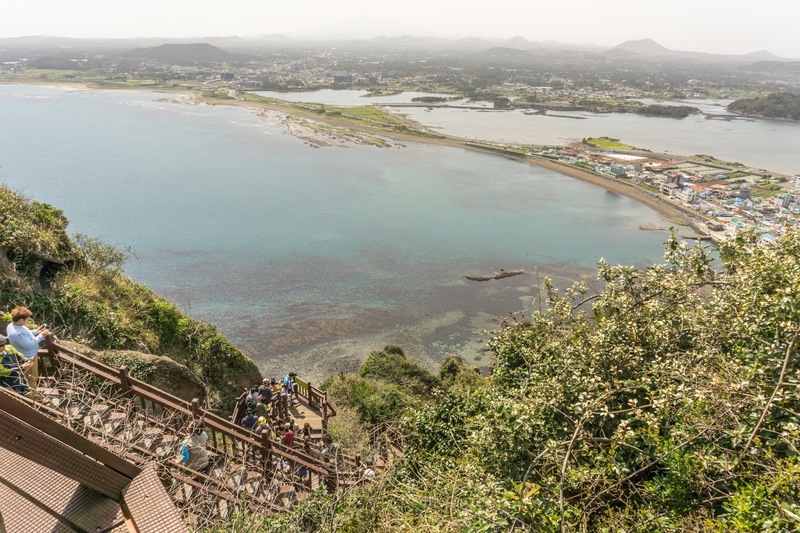 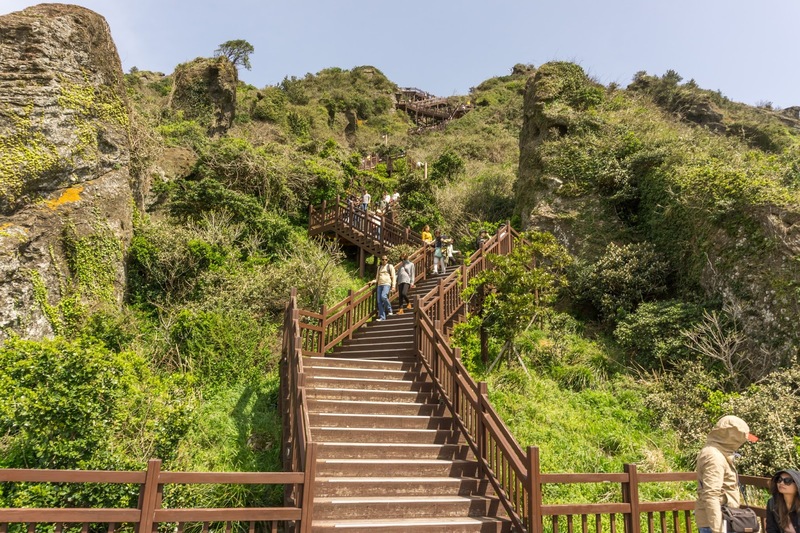 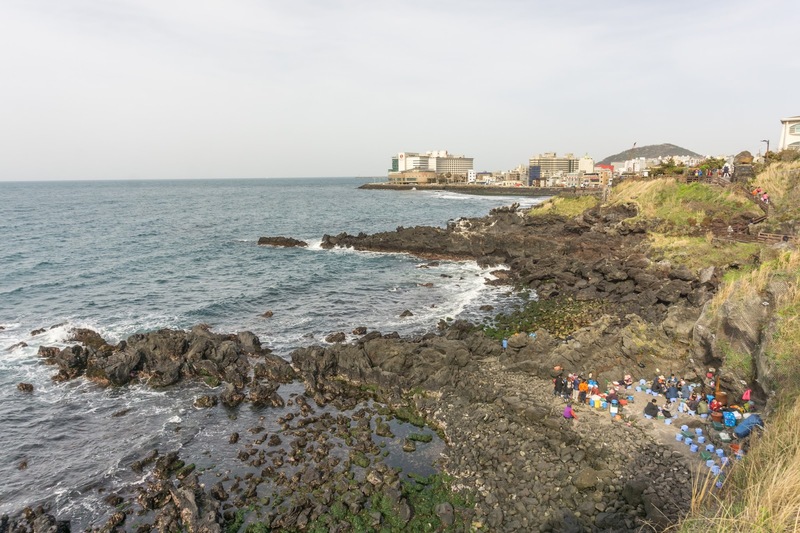 Jeju Stone Park covers a vast areal, and there are several walking courses recommended. 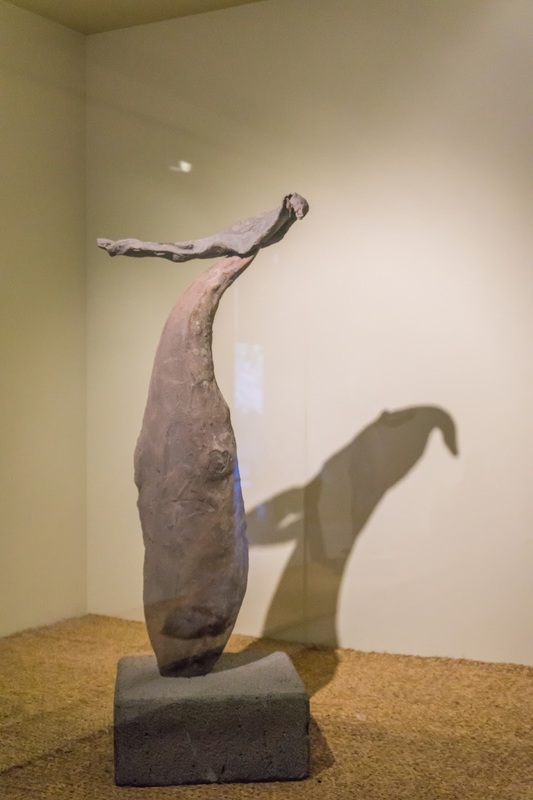 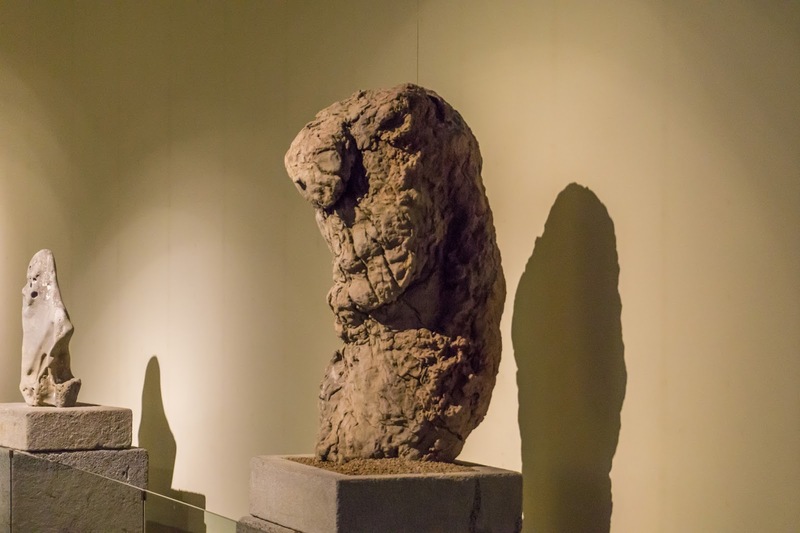 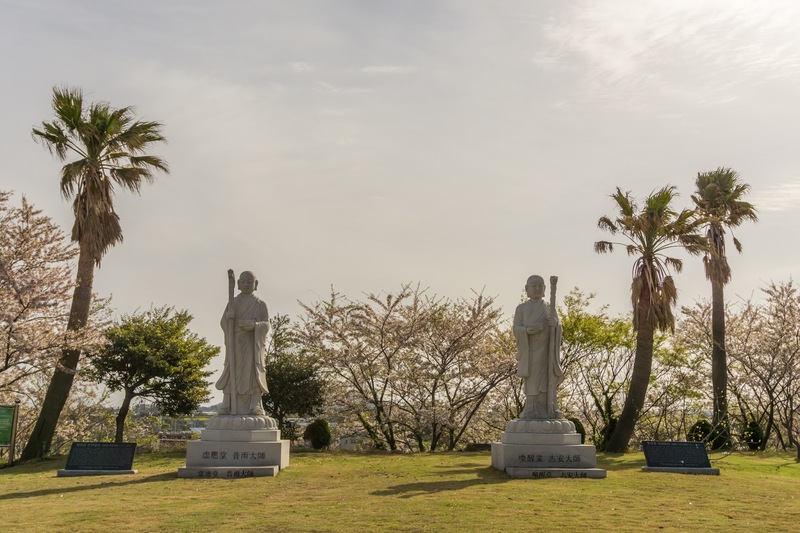 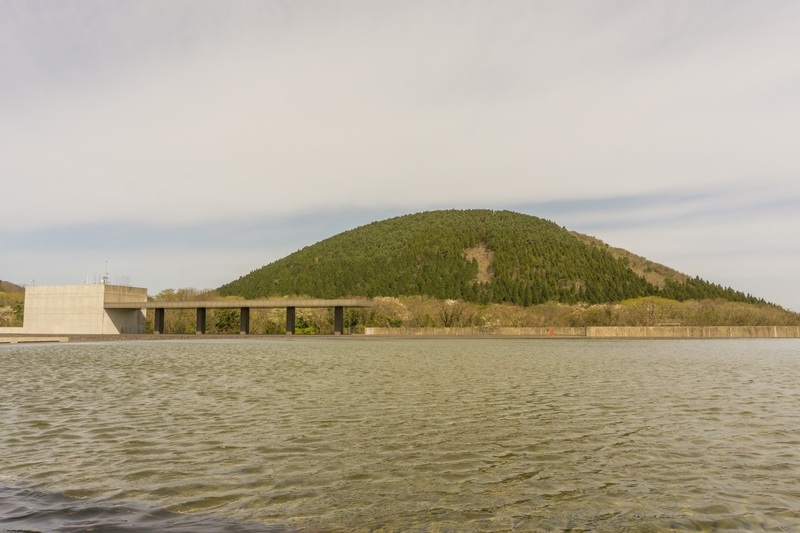 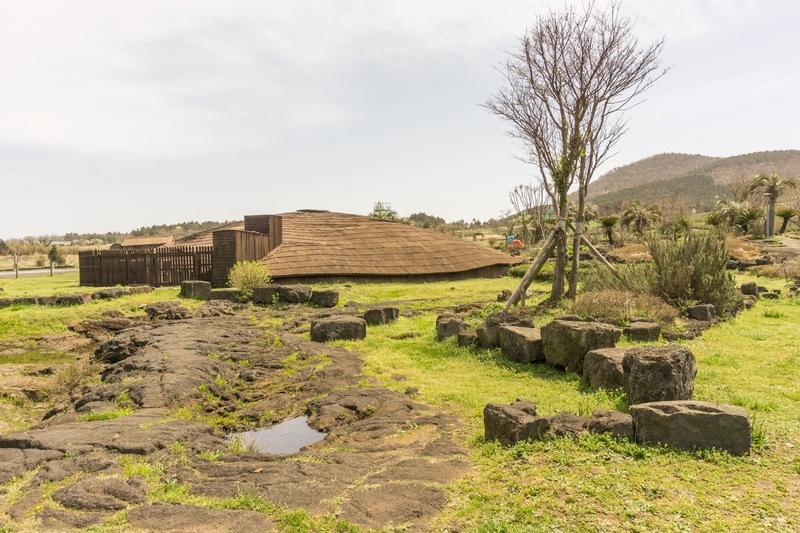 It is based on the mythology of Seolmundae Halmang (Grandmother Halmang) and her creation of Jeju Island. 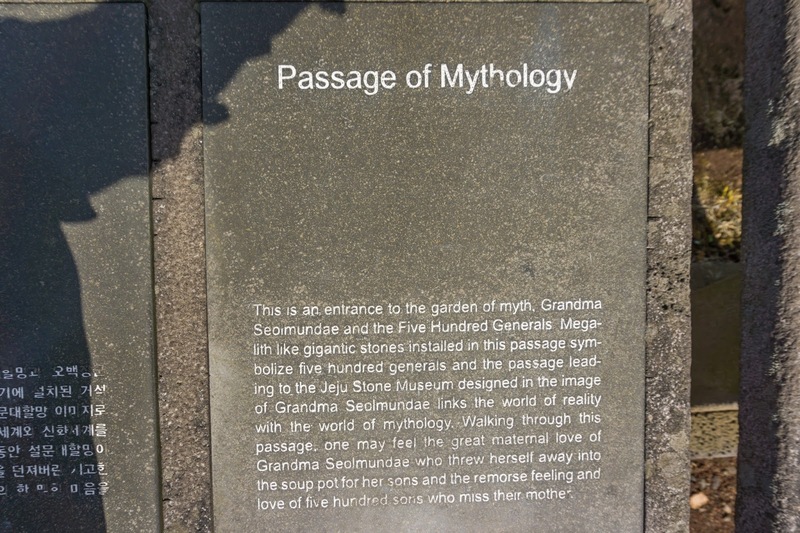 We started with "Course 1 - Garden of Myth" and the "Path of Legend." 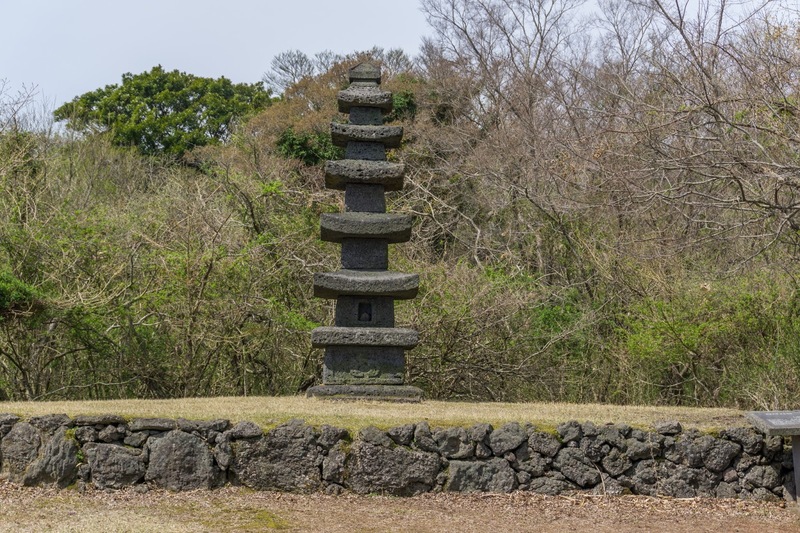 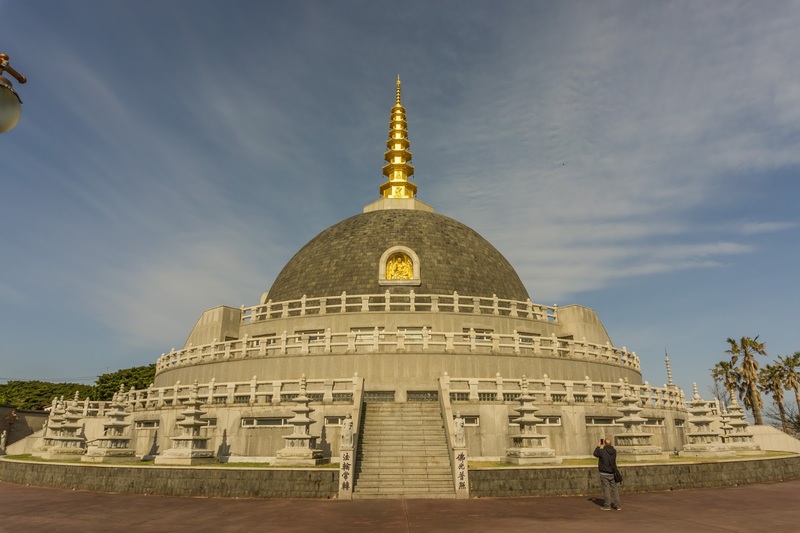 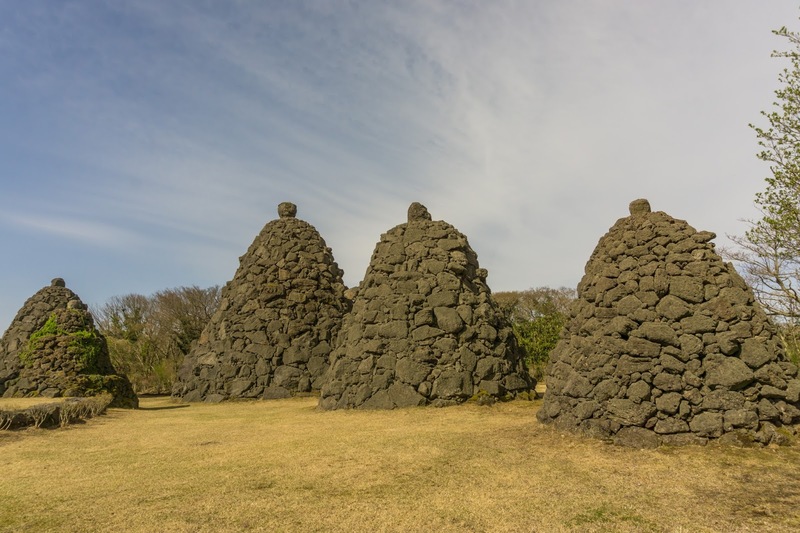 The huge stones along the way are meant to symbolize five hundred generals. 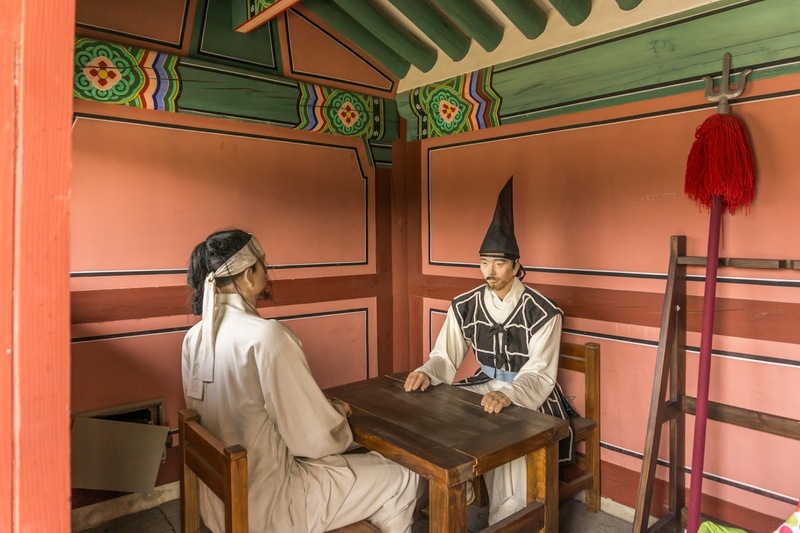 This is culled from the story "Seolmundae Halmang and the Five Hundred Generals." 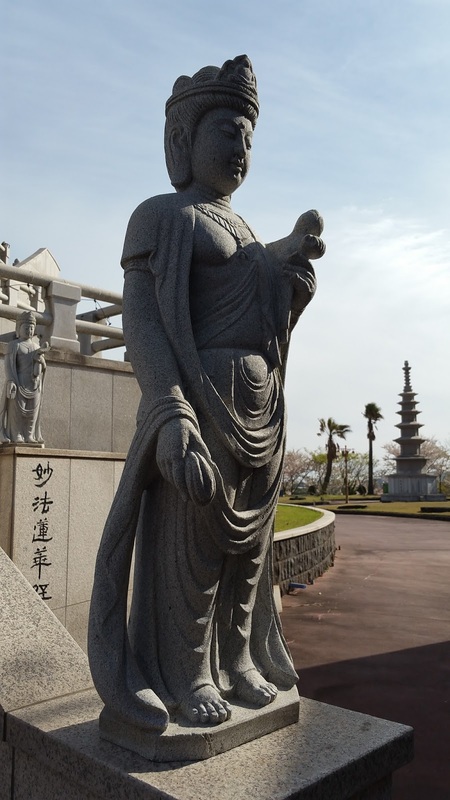 It is told, that she was a giant (49.000 meters tall!) 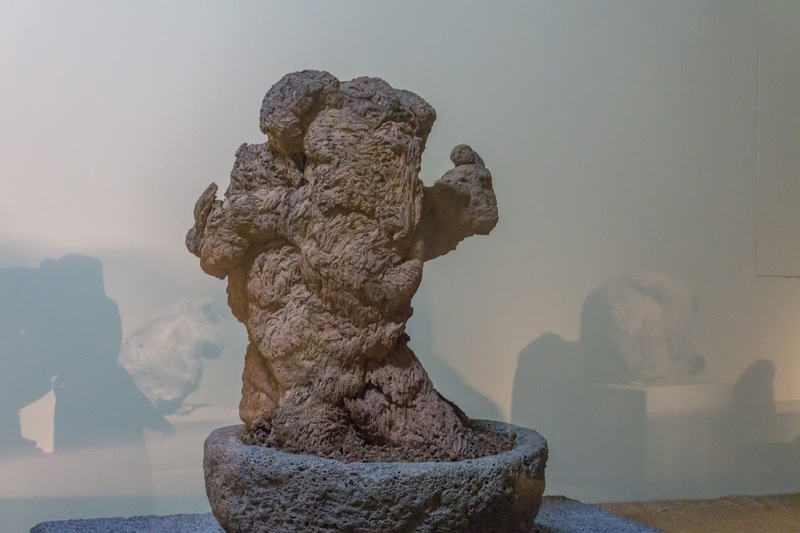 and threw herself into a stone cauldron to feed her five hundred starving sons. 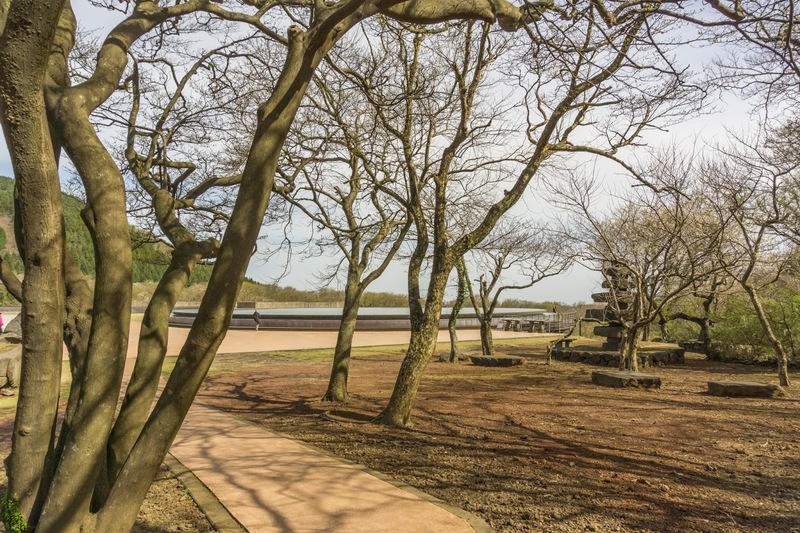 The azalea blossoms are said to be colored by their tears of blood. 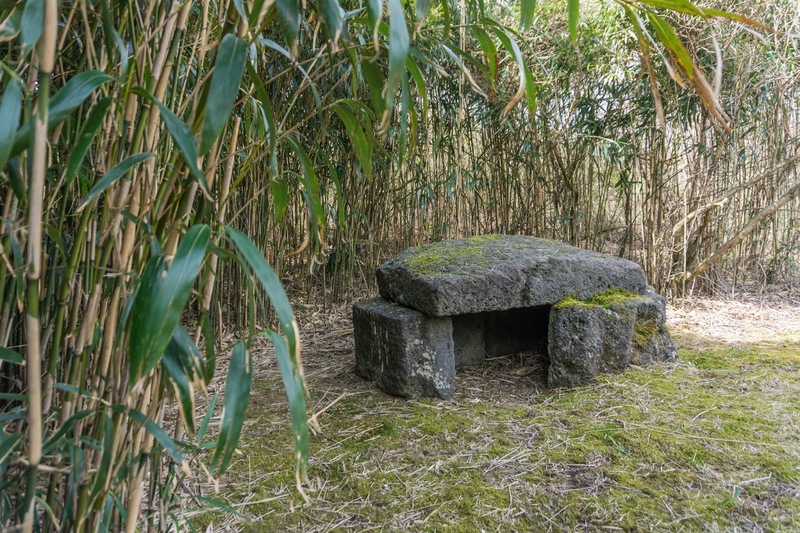 We also came to an altar for her. 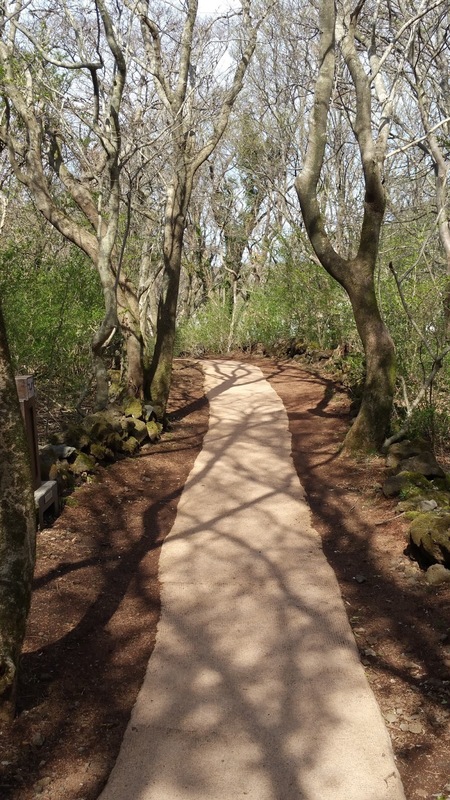 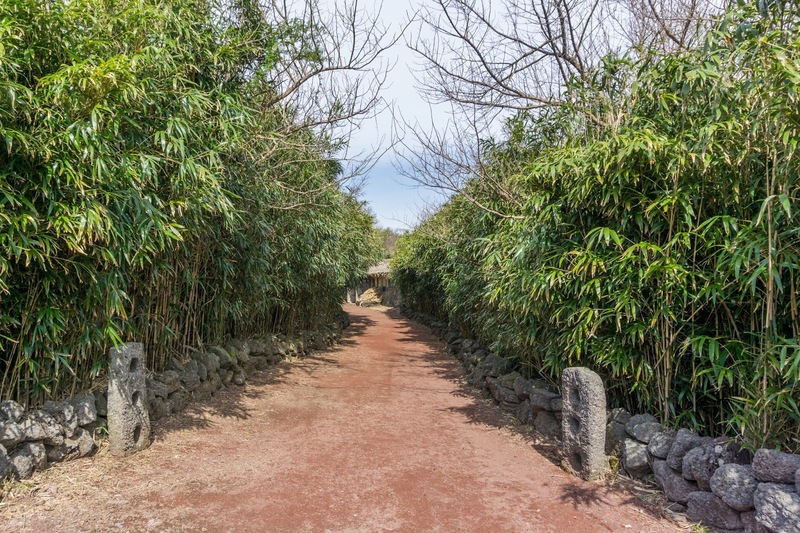 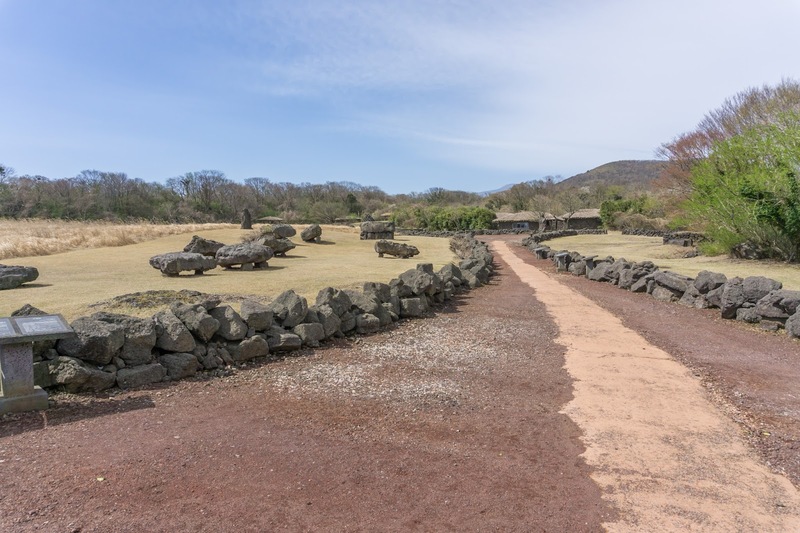 The path leads next to the Sky Pond and the Jeju Stone Museum. 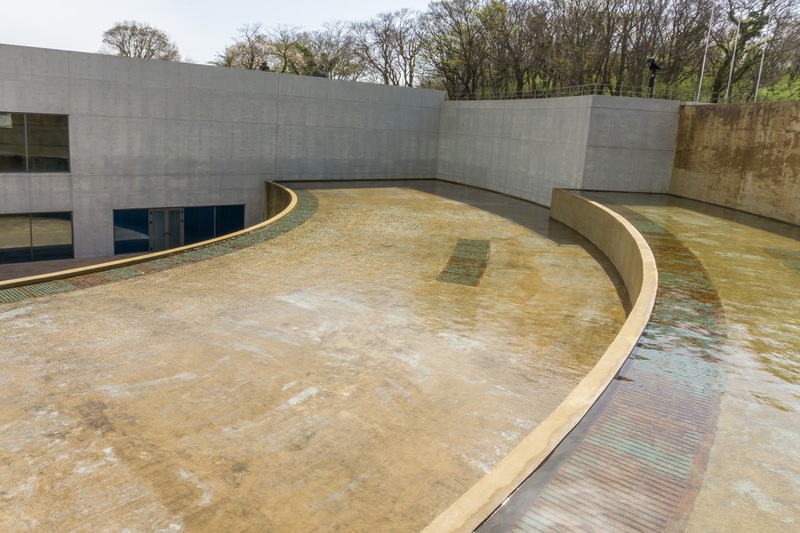 It all has the modern design, and the sky pond on top of the museum also symbolizes the pot, Grandmother Halmang threw herself into. 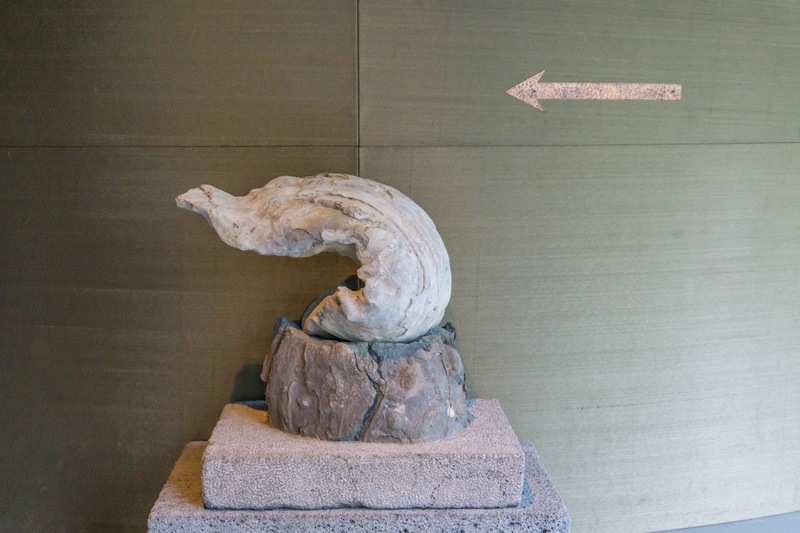 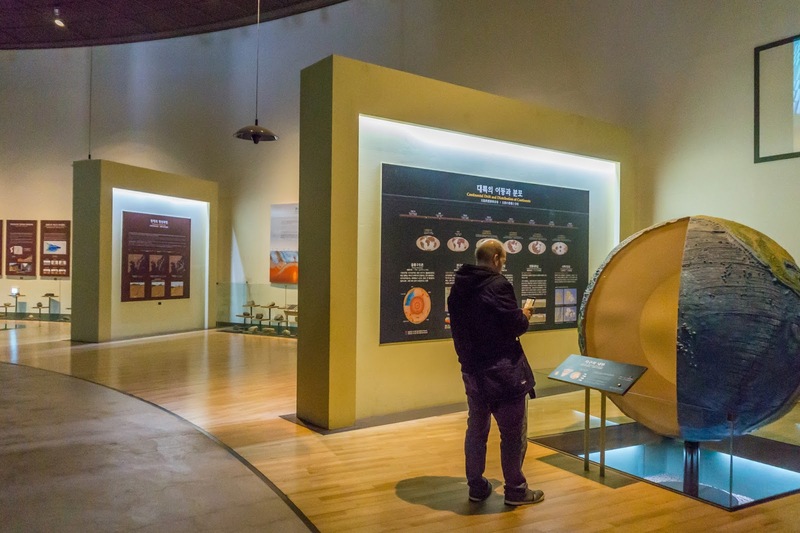 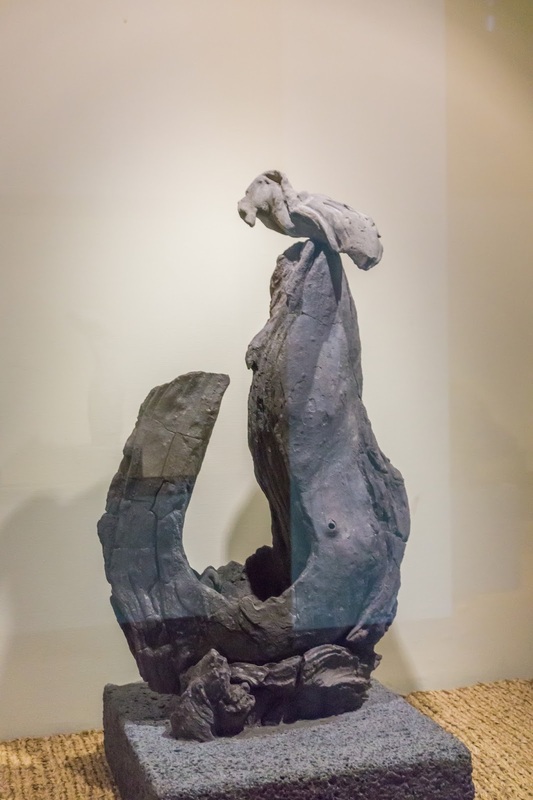 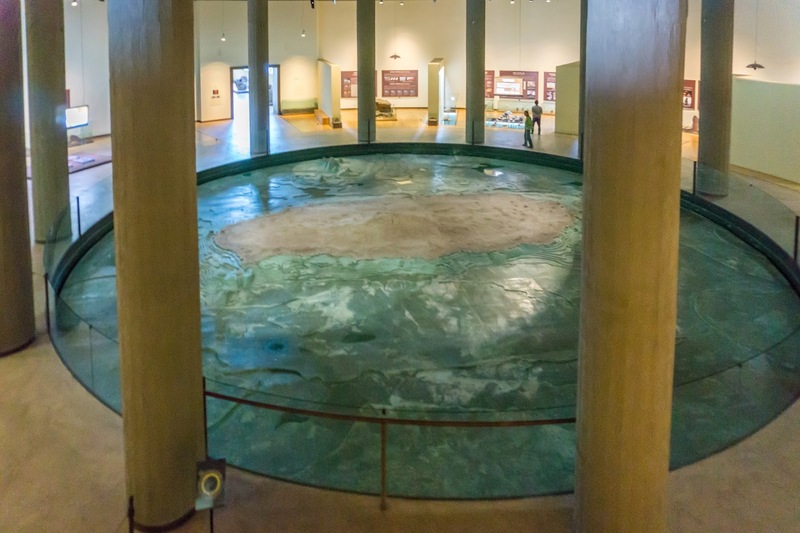 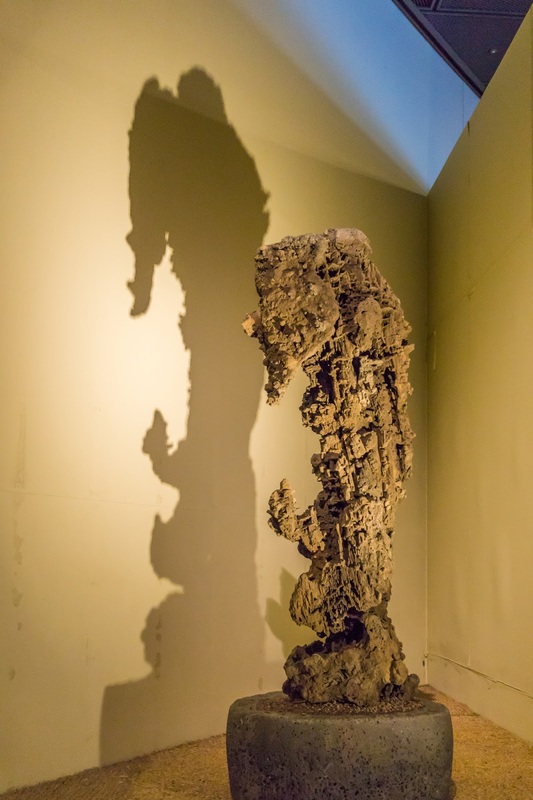 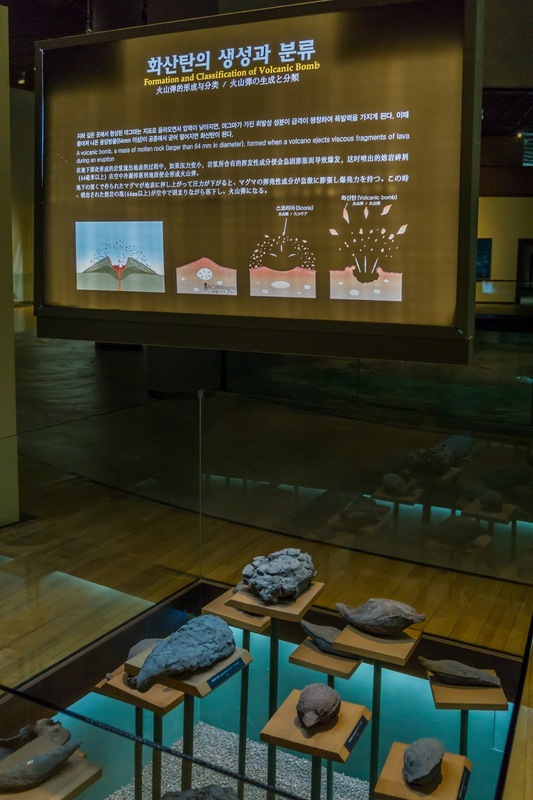 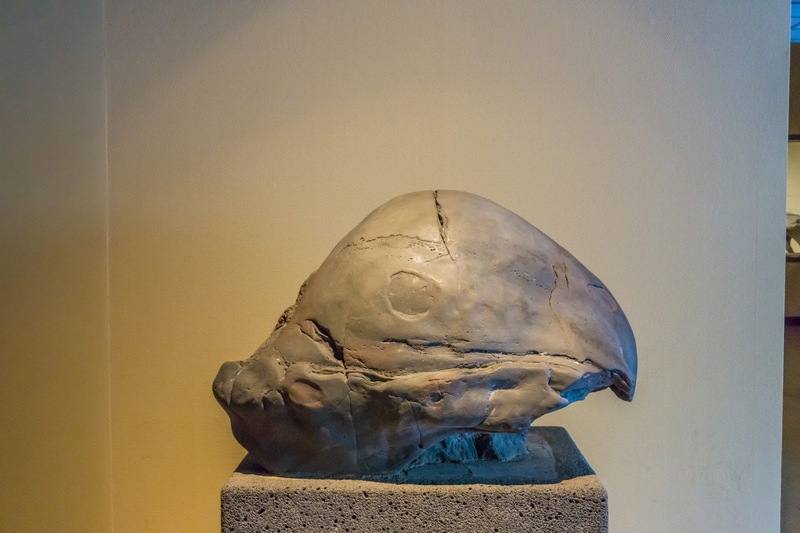 The museum itself is very modern, spacious and informs about the volcanic evolution of Jeju Island. 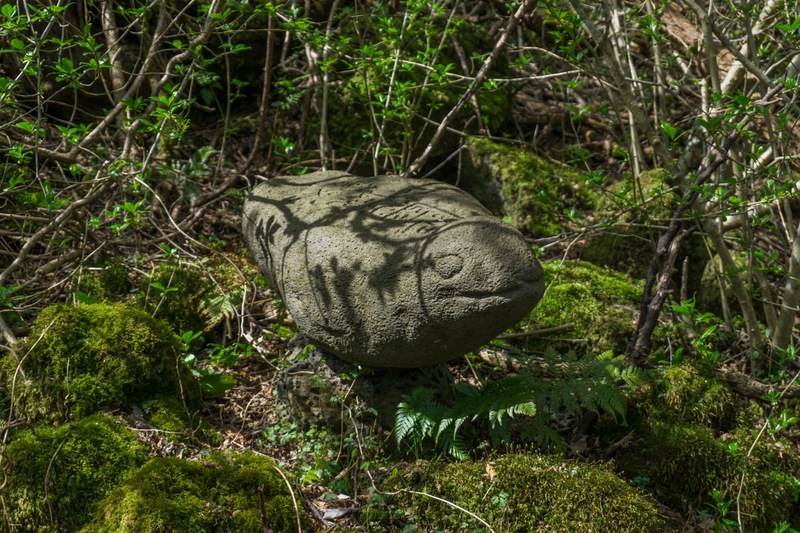 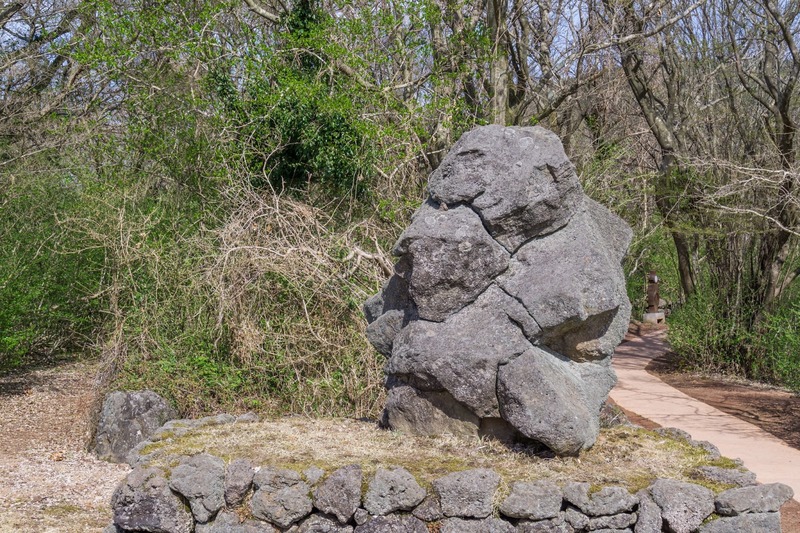 There are also quite some rocks with unique shapes. 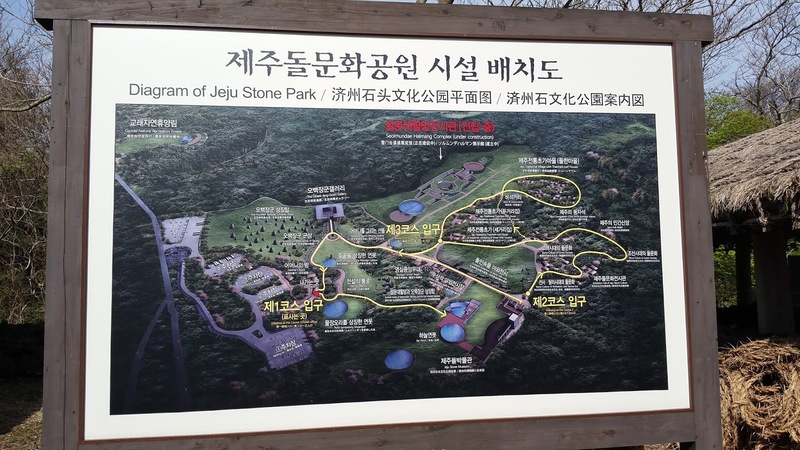 After the museum, we walked further, with a mixture of the two others courses, I think. 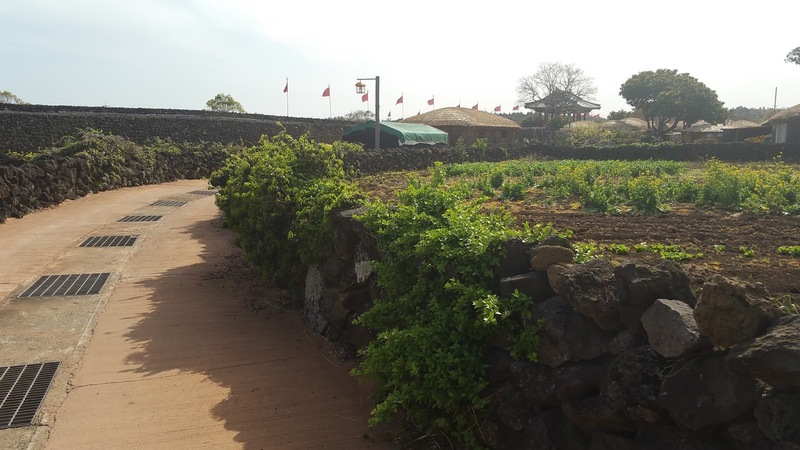 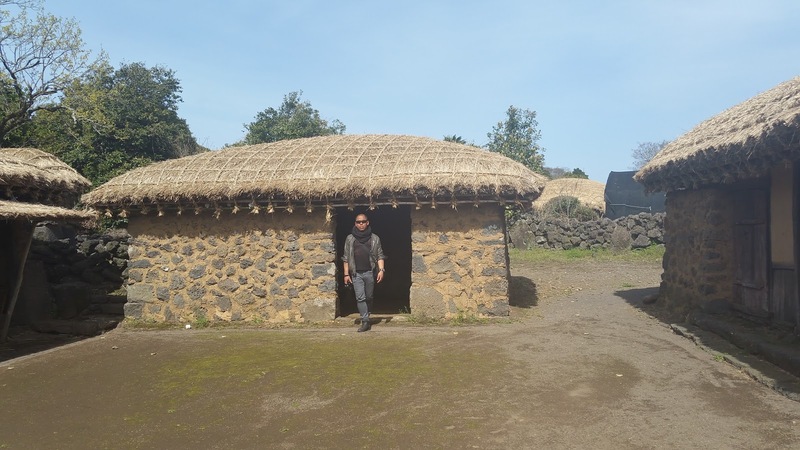 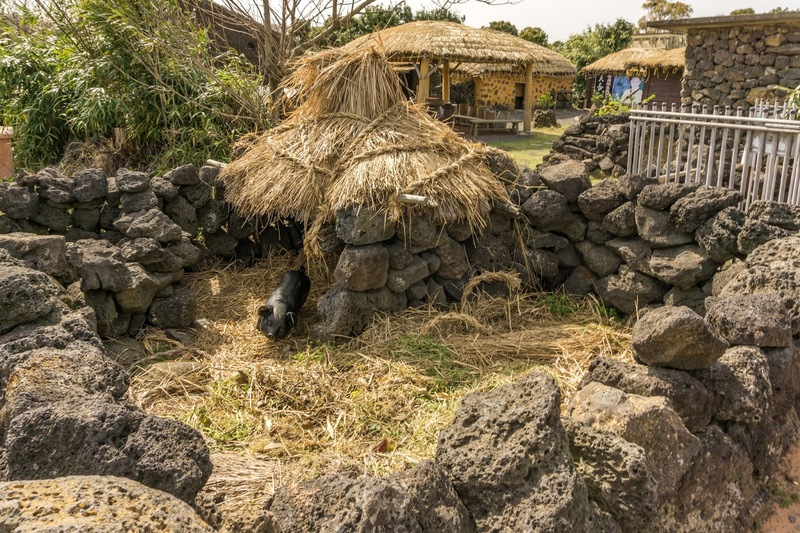 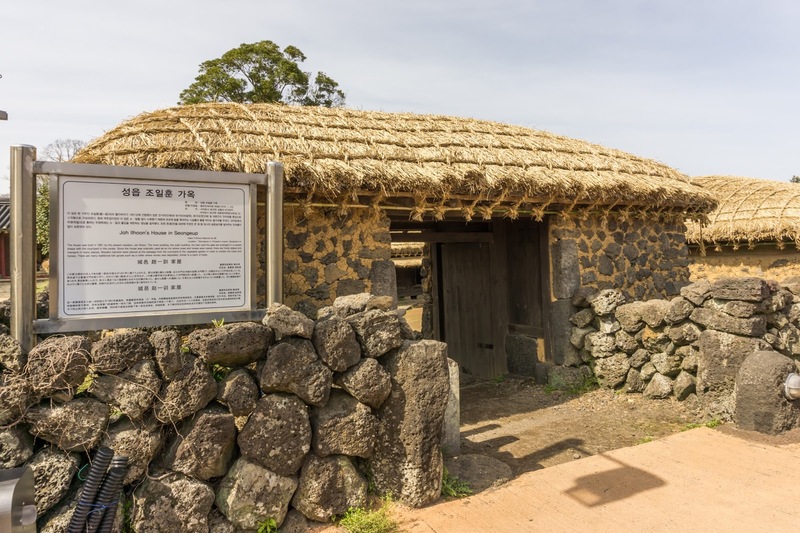 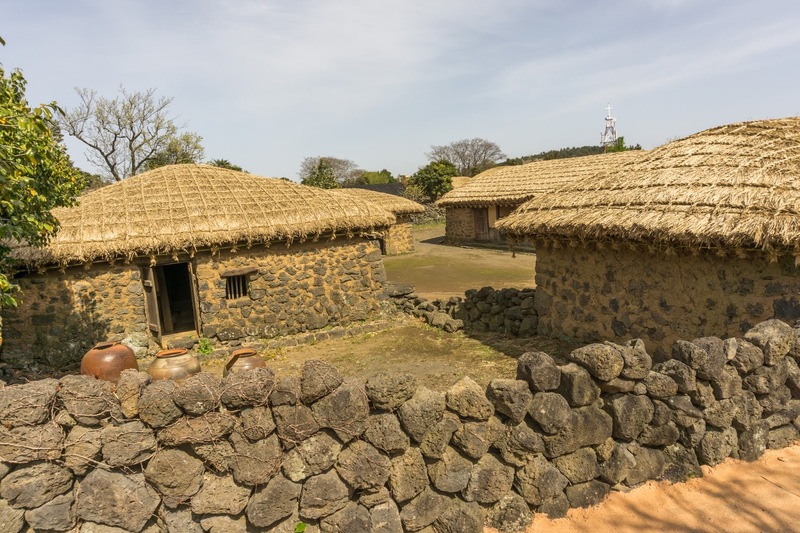 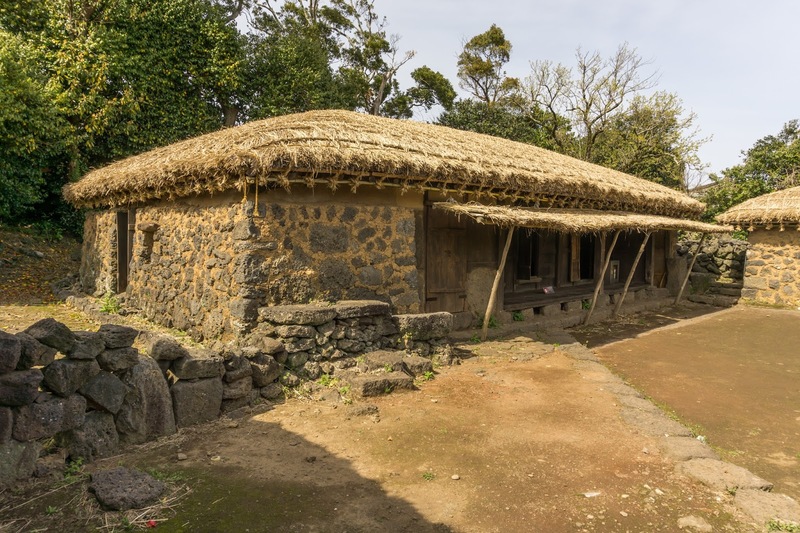 At least, we visited the Jeju traditional thatched-houses and also saw a bit of the stone culture in different dynasties, including tombs, pagodas and Maitreya statues. 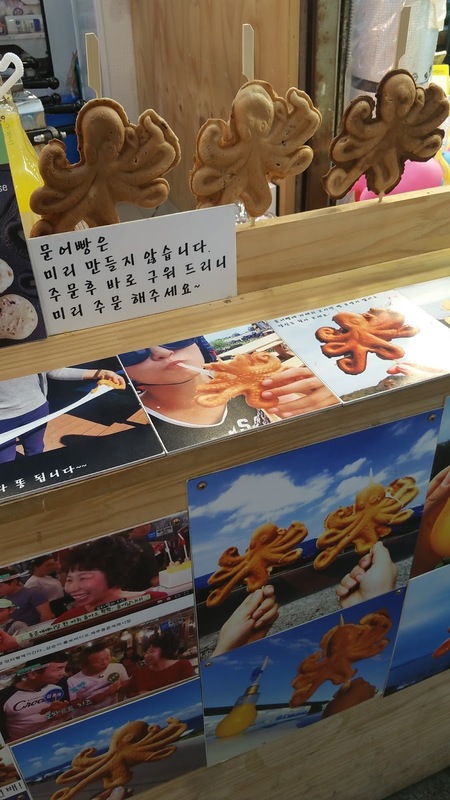 I really liked it! 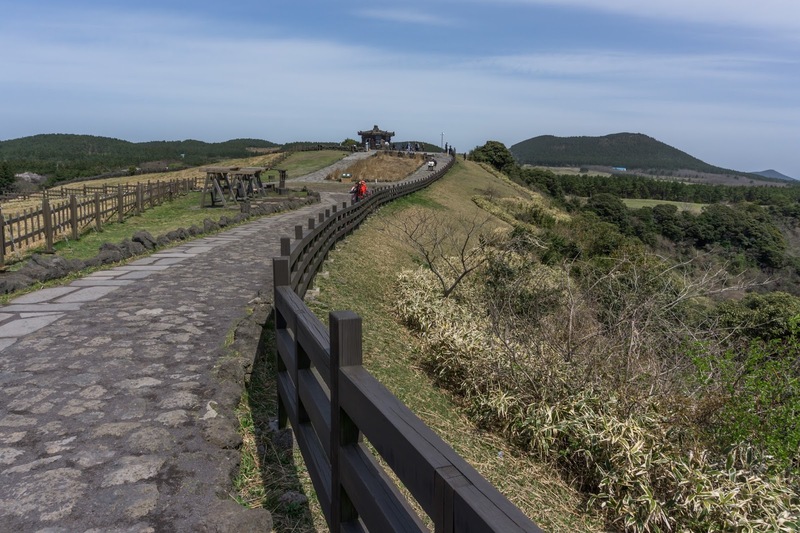 I actually love visiting open-air museums, like the ones we went to at the Sun Moon Lake in Taiwan, the Yoshinogari Historical Park in Japan or the smaller Rogatec Open Air Museum in Slovenia. 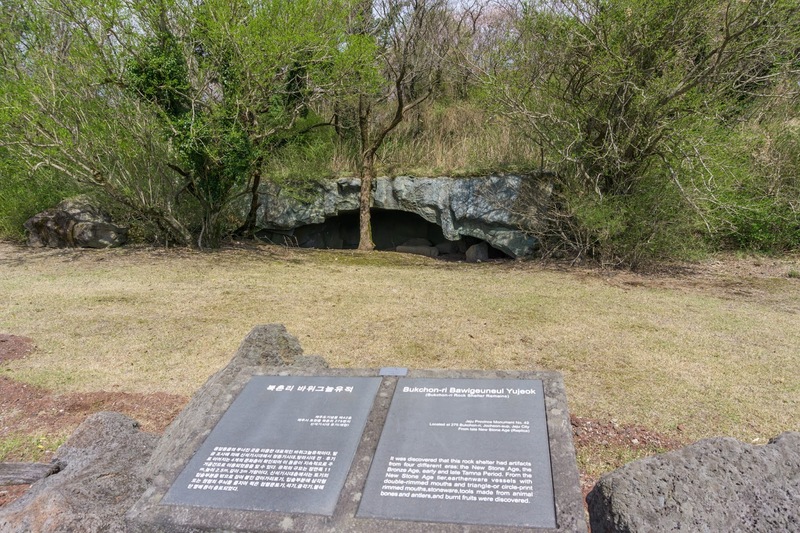 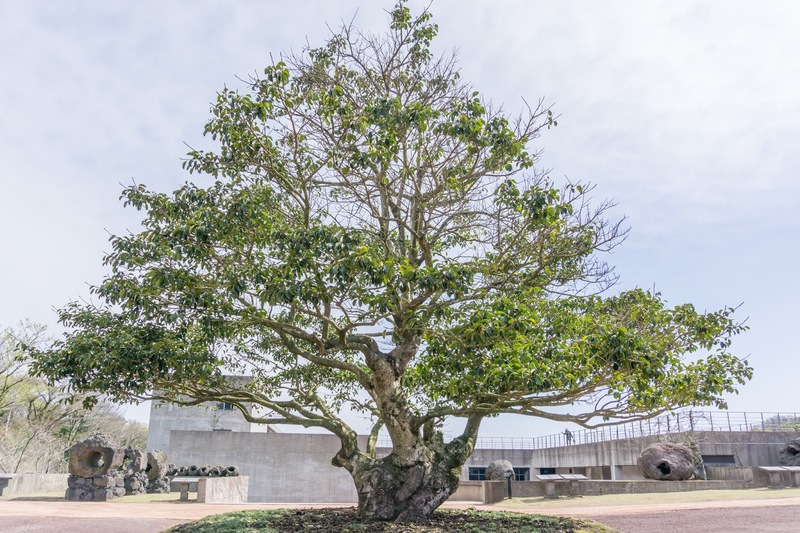 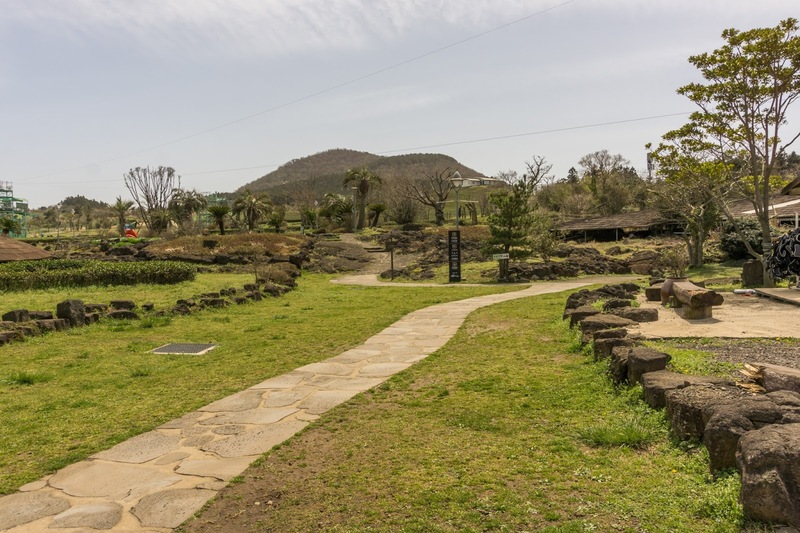 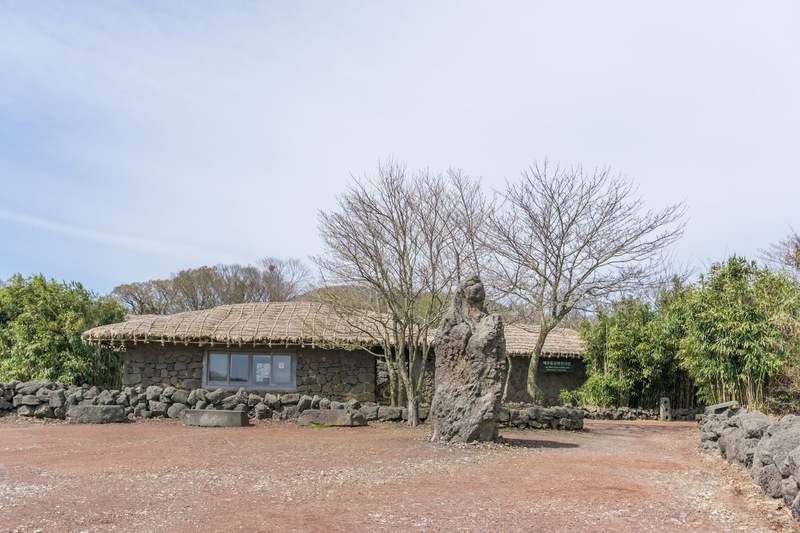 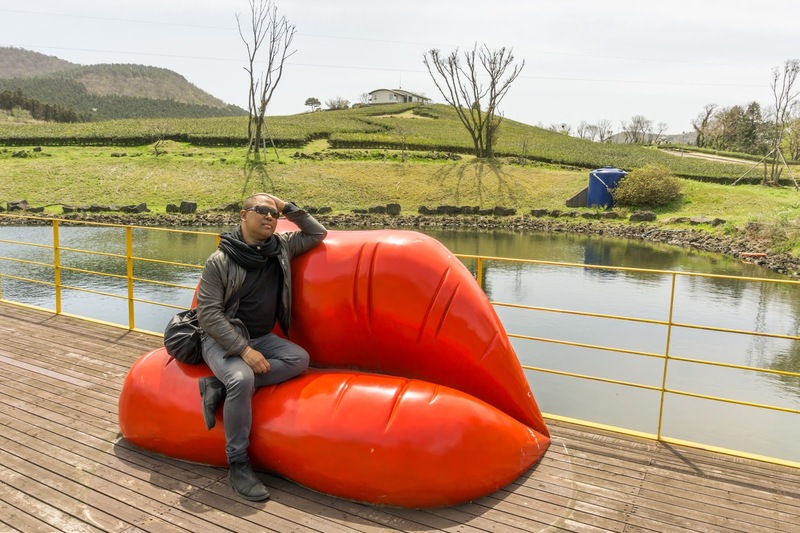 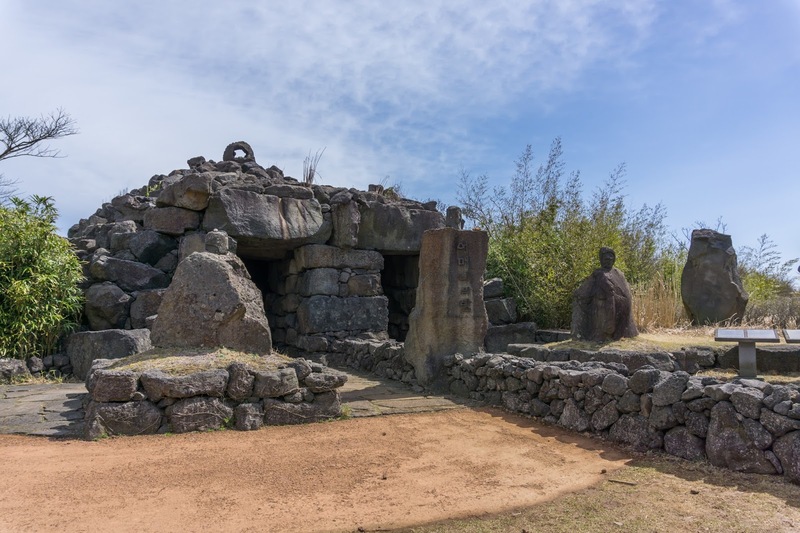 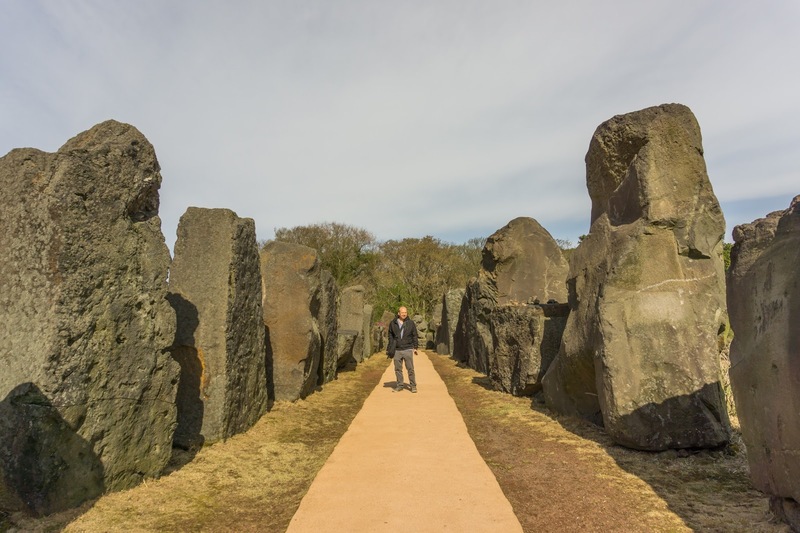 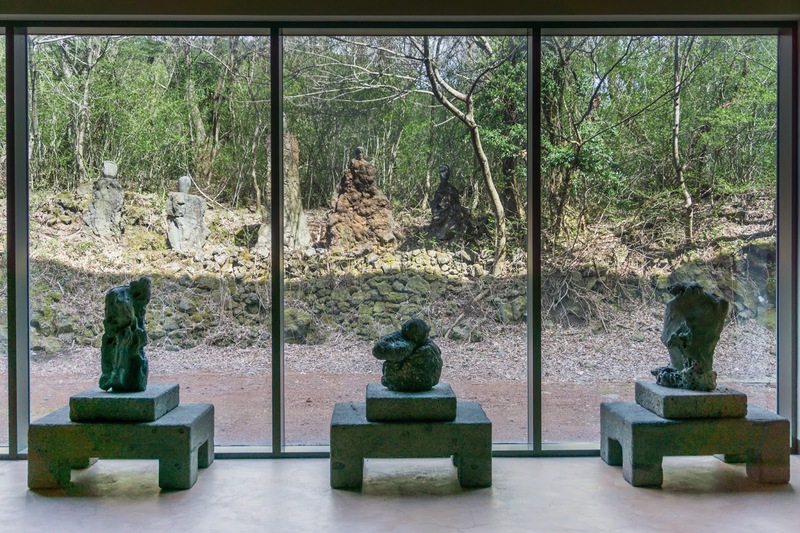 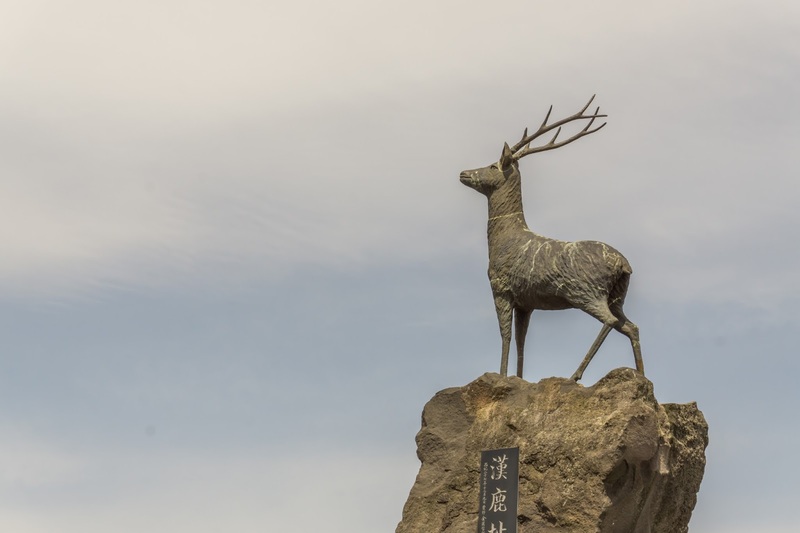 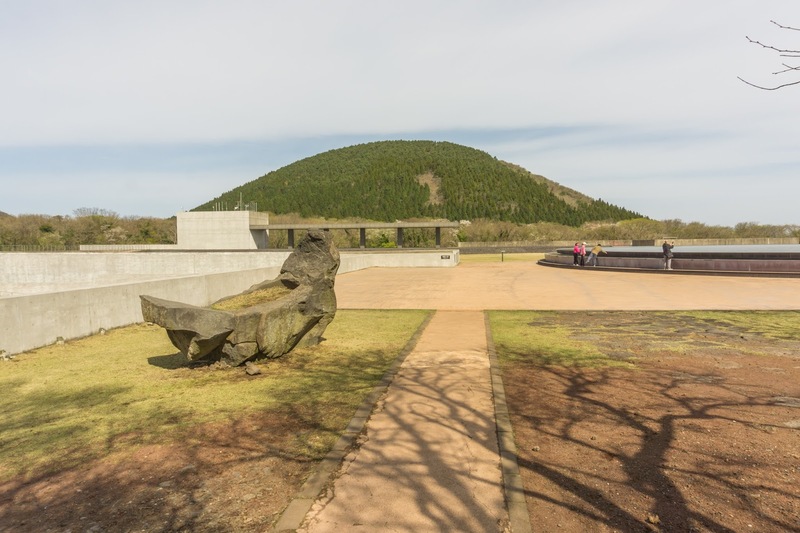 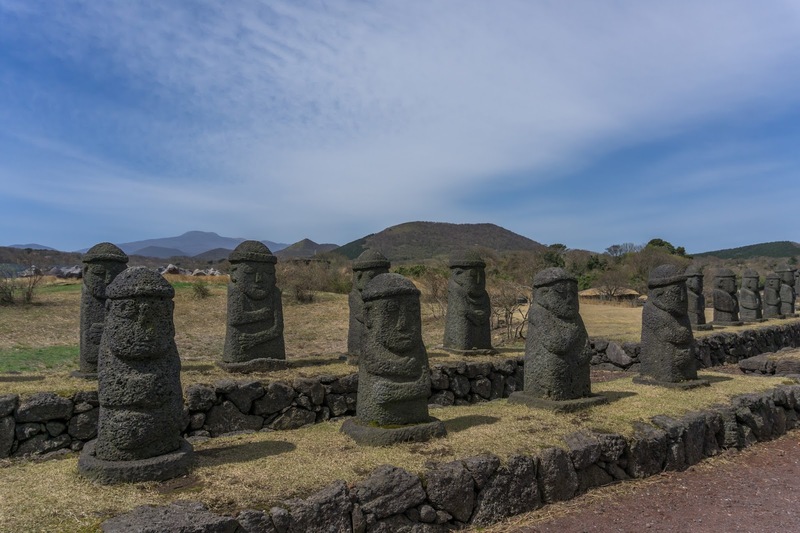 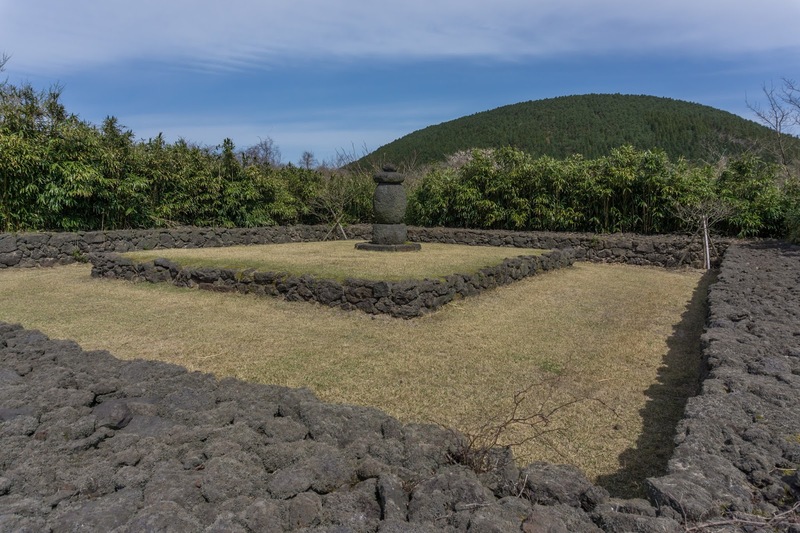 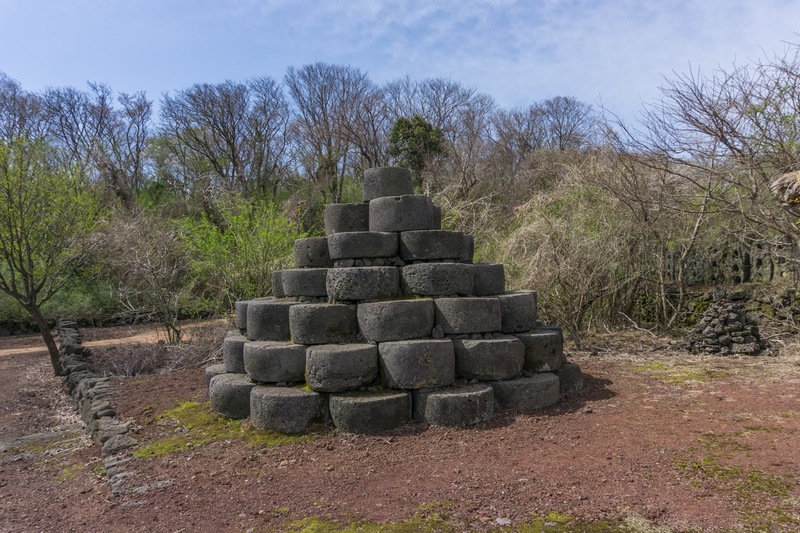 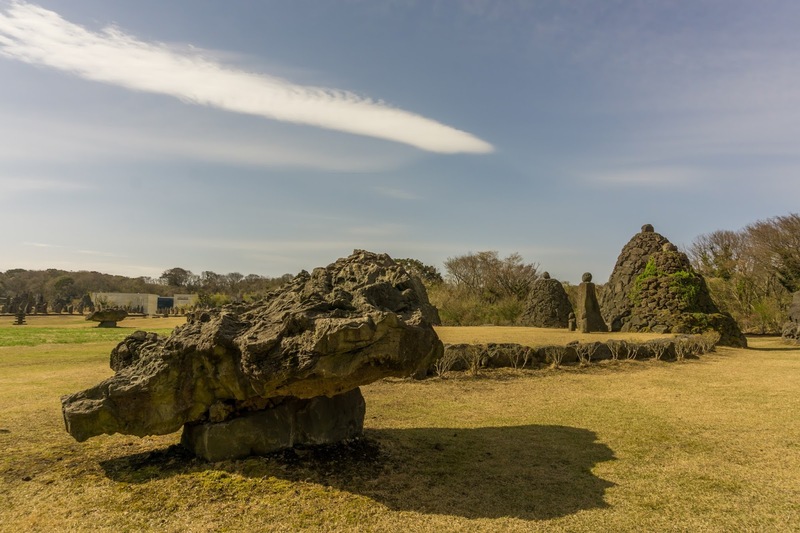 The Jeju Stone Park is an extensive open-air museum, with pretty much to see. 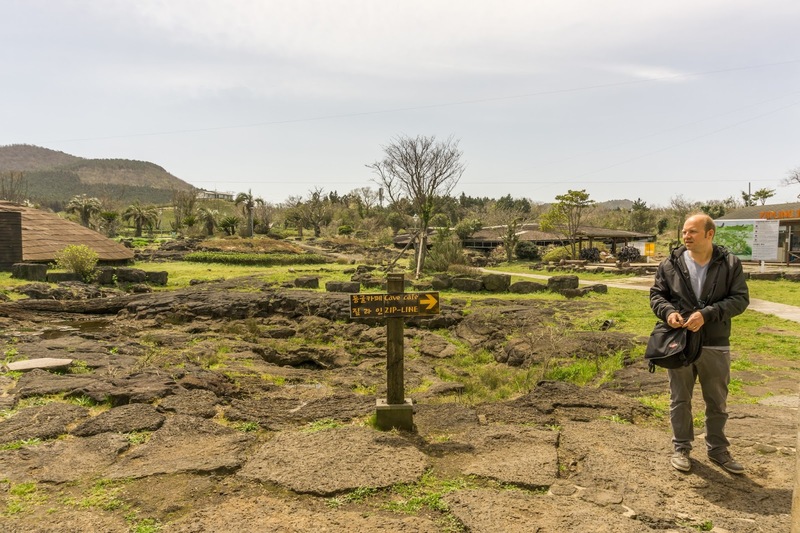 Now it was time to see something of the volcanic island, and we drove to the nearby Sangumburi Crater. 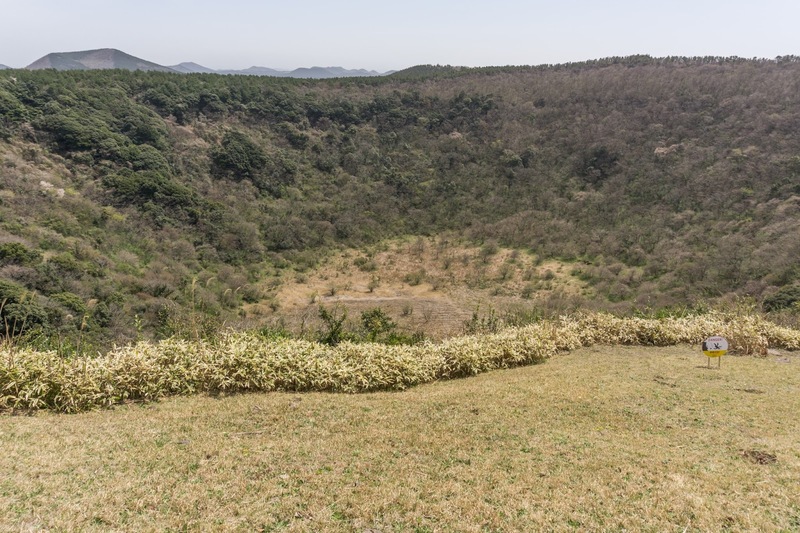 It was a crater with a scope of two kilometers and was formed by an explosion without the ejection of lava or ash. 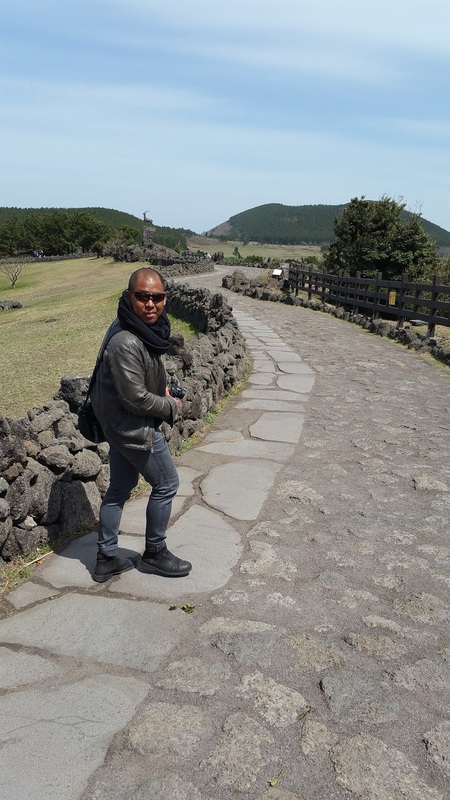 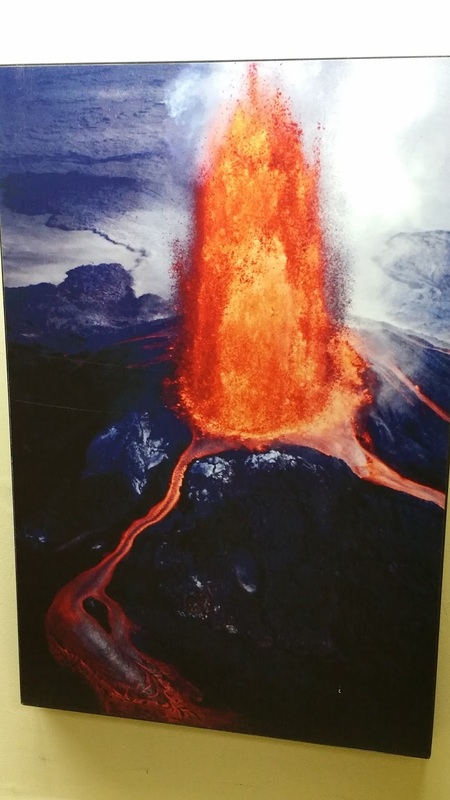 Unlike other volcanoes, we visited before, like the Taal Volcano and the Mount Mayon in the Philippines, the Sakurajima Volcano in Japan or the Hverfjall Crater in Iceland. 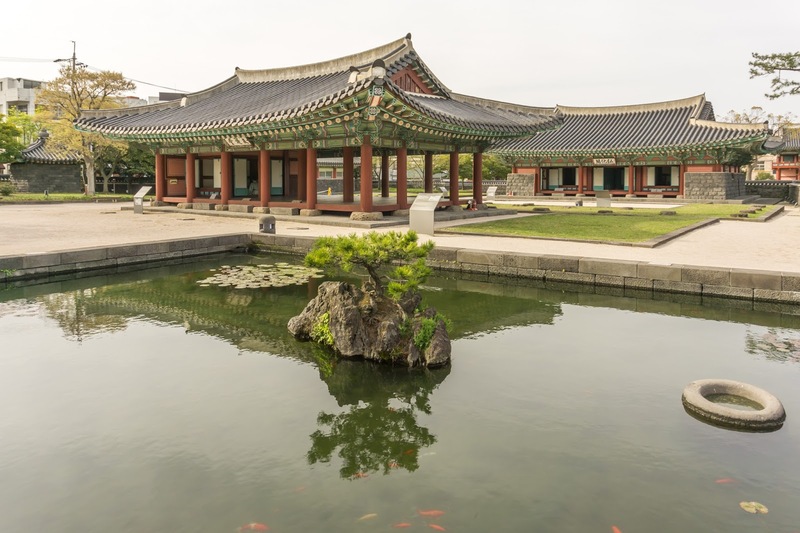 We also wanted to visit a tea farm and also wanted to take a coffee or tea break and drove to Daheeyeon Garden. 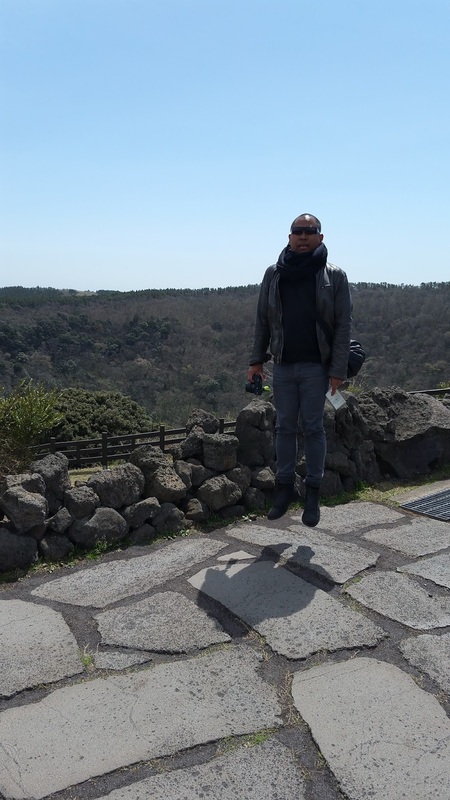 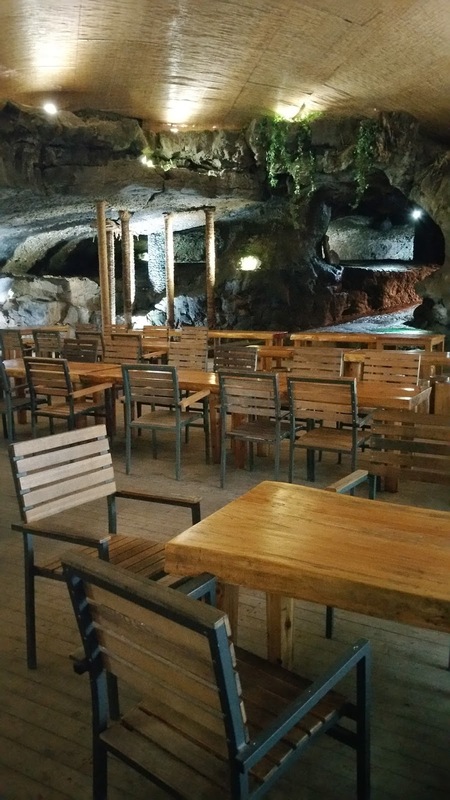 There we bought some (tea) gifts, walked around the tea plantation and visited the eccentric cafe, located in a cave. 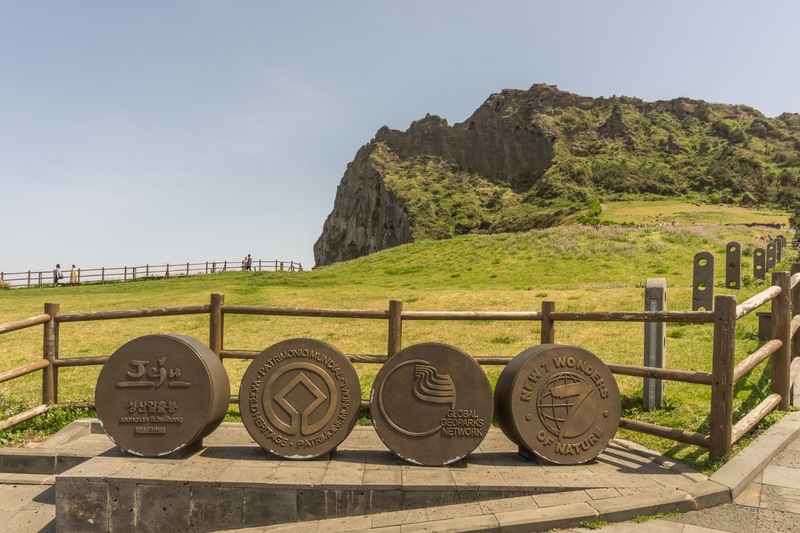 From the tea garden, our reliable driver brought us to the next attraction, one of Jeju Island's most prominent: The Seongsan Ilchulbong Peak. 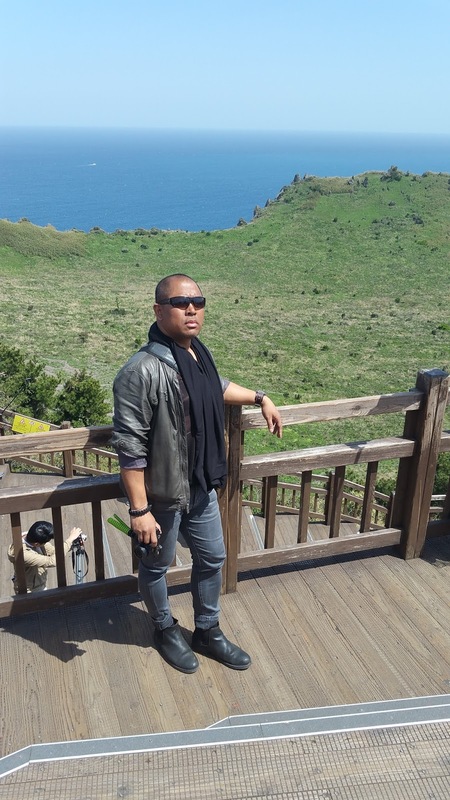 We walked the whole way up to visit the crater on top and enjoy the fantastic view. 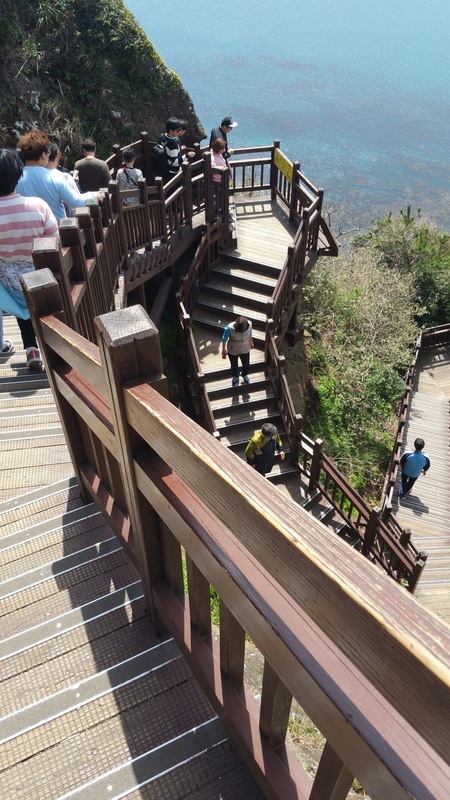 It's a bit strenuous but quite rewarding. 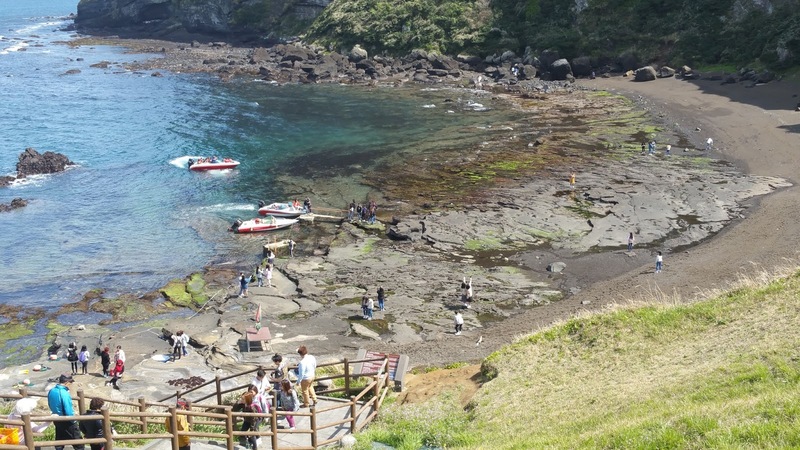 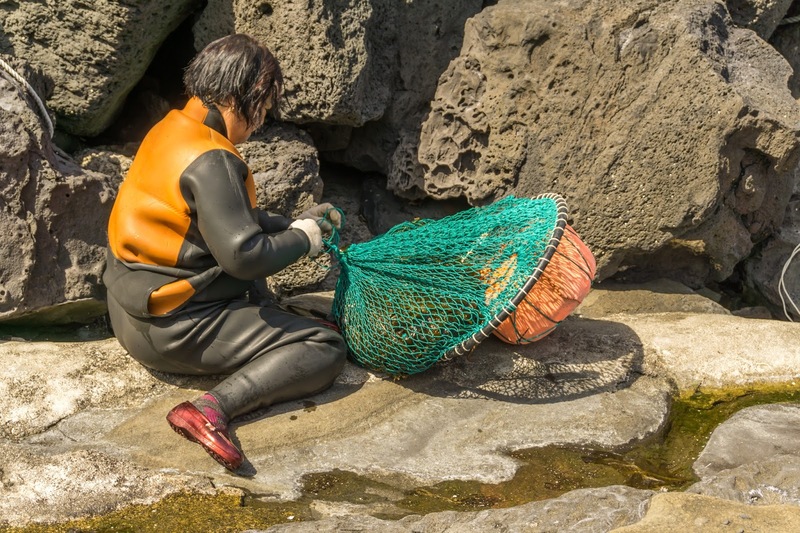 We still wanted to see more and followed a path down to the shore, where Jeju's famous women divers, the Haenyeo, also seem to work. 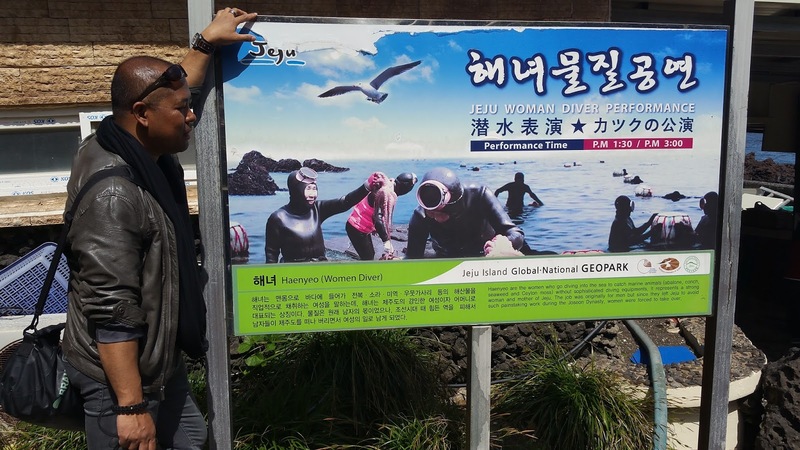 There was even signage for the "Jeju Woman Diver Performance." 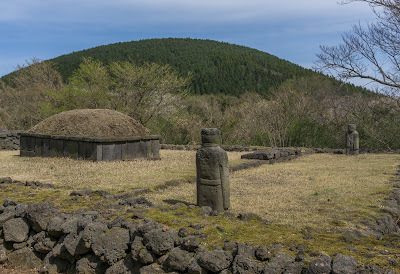 There wasn't much time left, but we still managed to drive to and then walk a bit through the beautiful Songeup Folk Village. 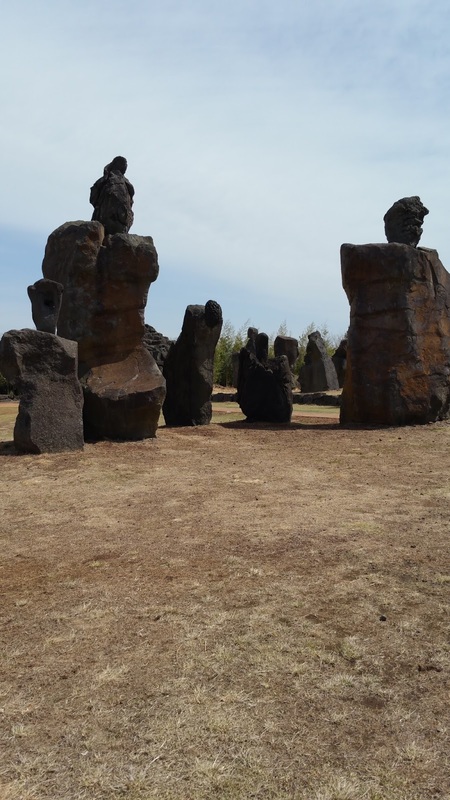 It took some time, to get back to the central city, but our driver still brought us to Yongduam Rock there, which is also called Dragon Rock. 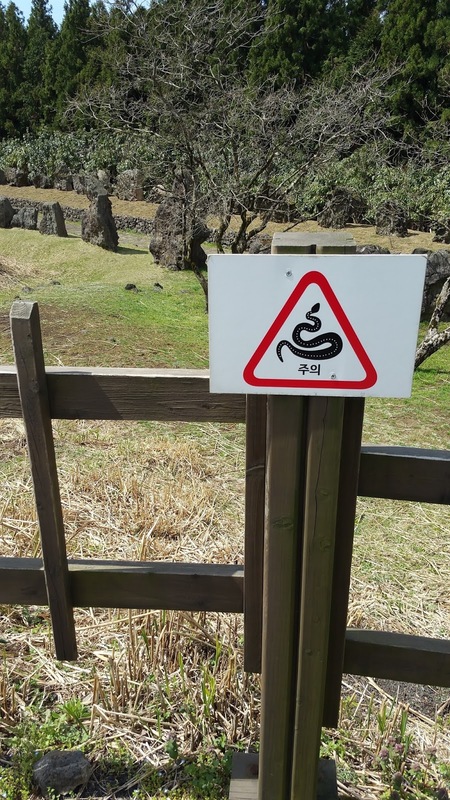 It couldn't really compete with the sights, we had already seen on the day. 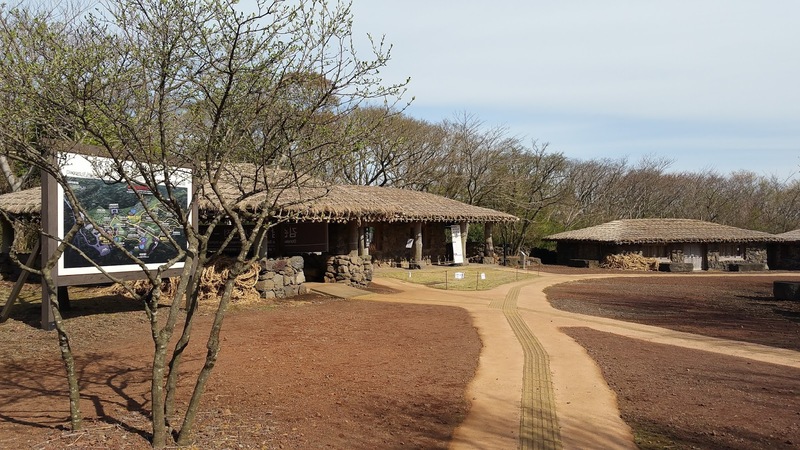 Our time was up anyway, but our driver also offered to bring us to the nearby Gwandeokjeong Pavilion as last stop. 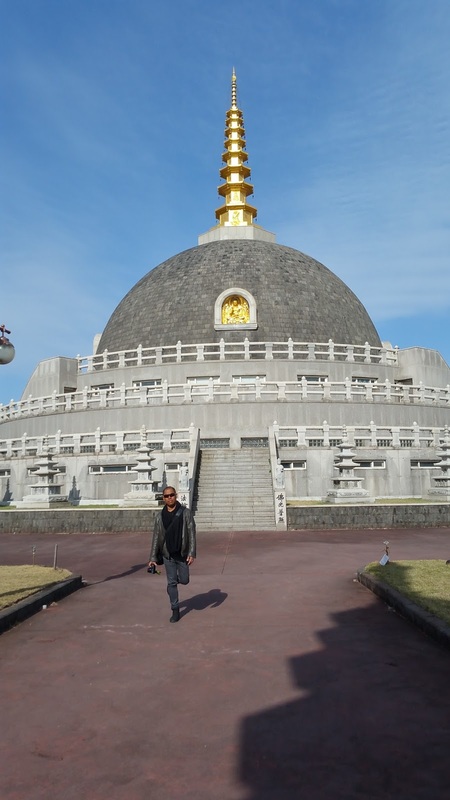 We told him, we would like to end the tour there (instead of at the hotel) and then maybe walk around a bit in the city. 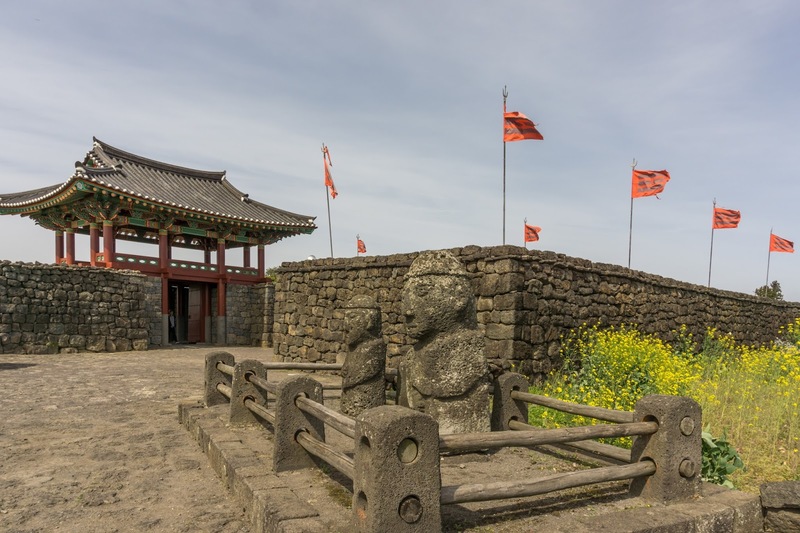 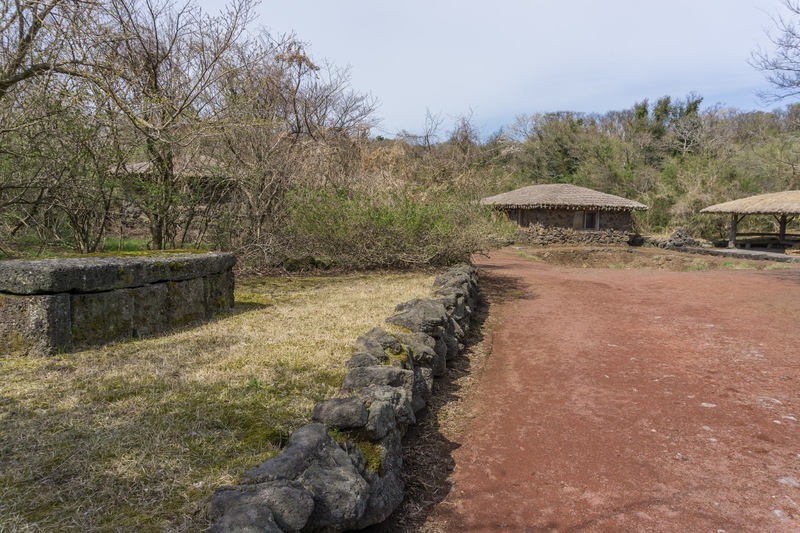 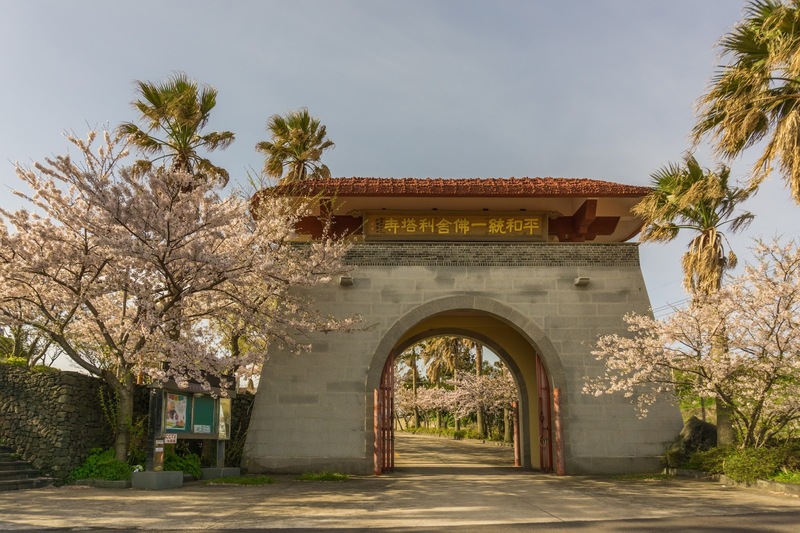 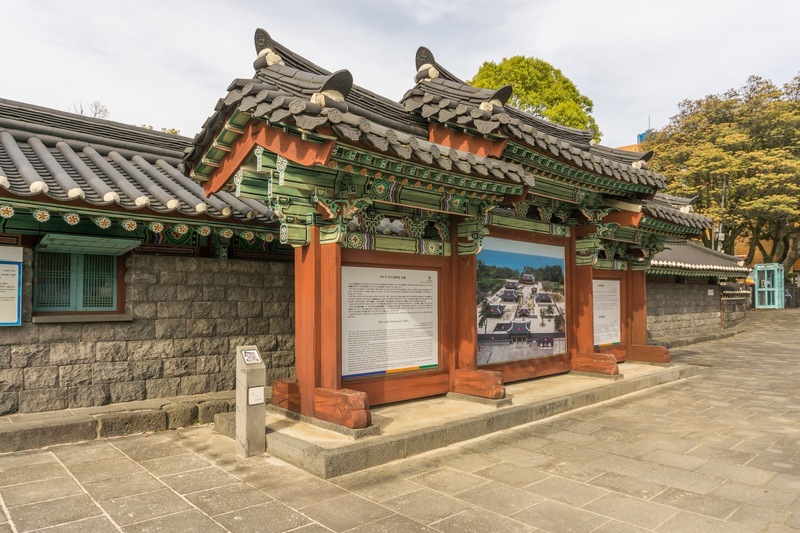 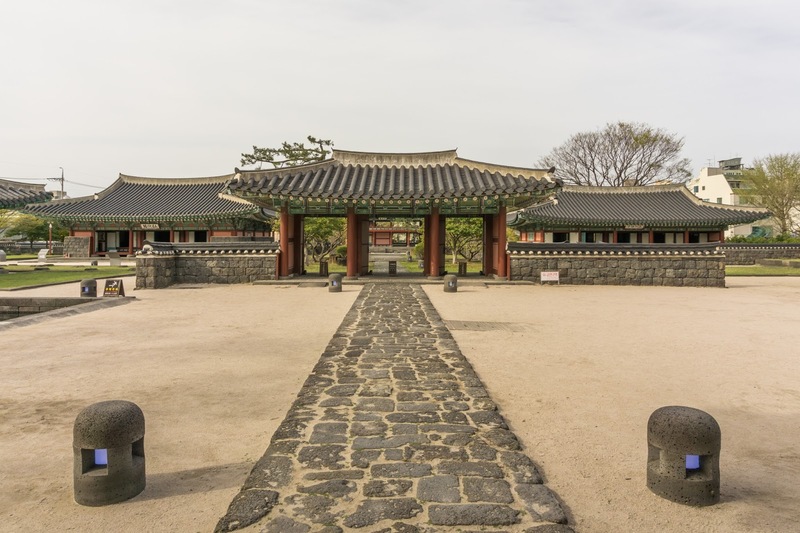 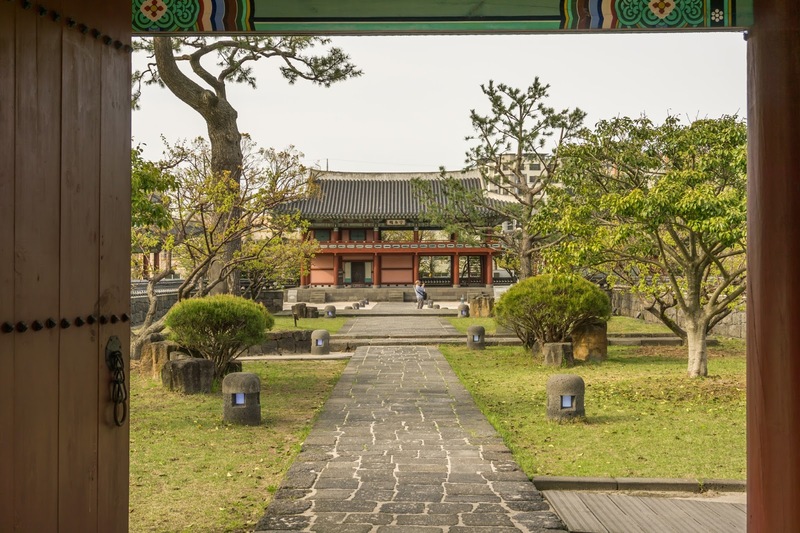 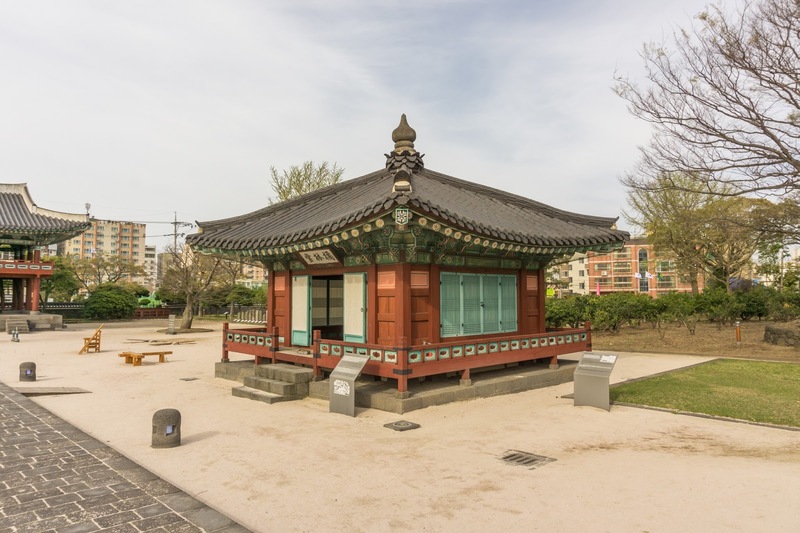 The pavilion is one of the oldest buildings on Jeju Island and very scenic too. 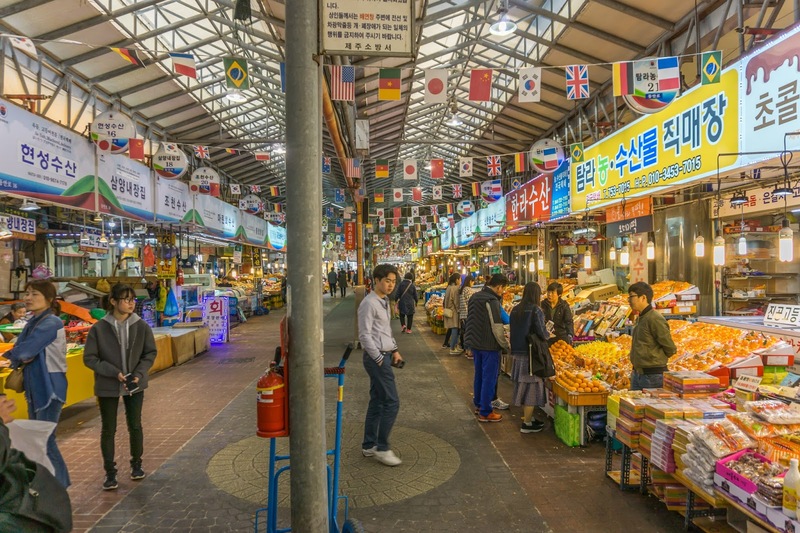 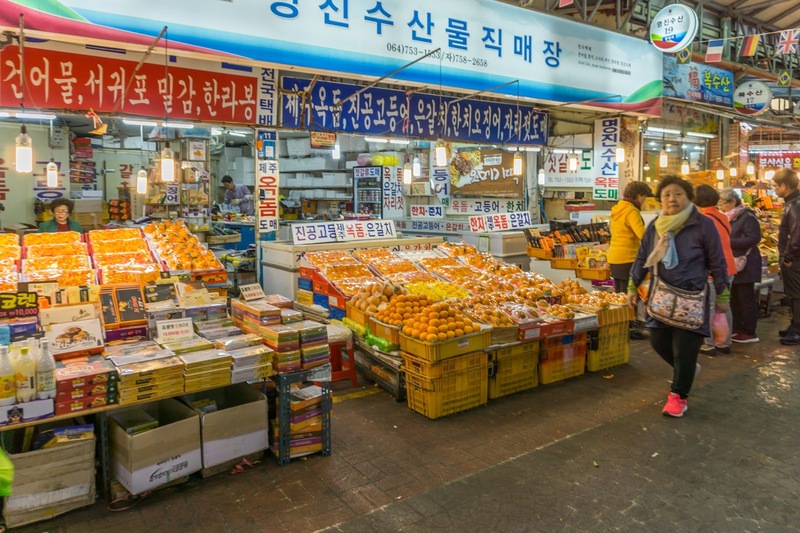 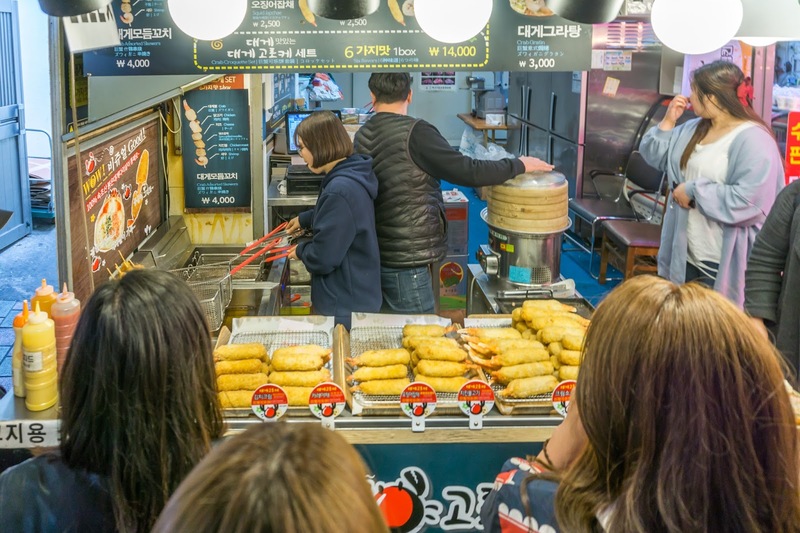 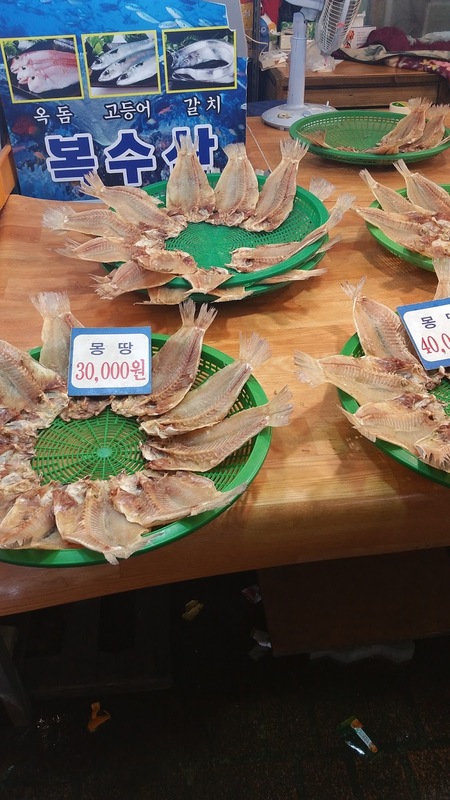 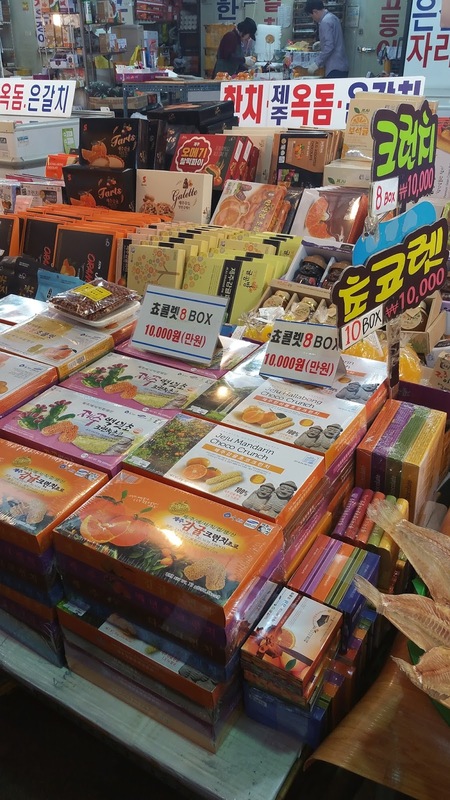 It was just a short walk from the pavilion to the Dongmun Traditional Market, where we bought cookies and other souvenirs. 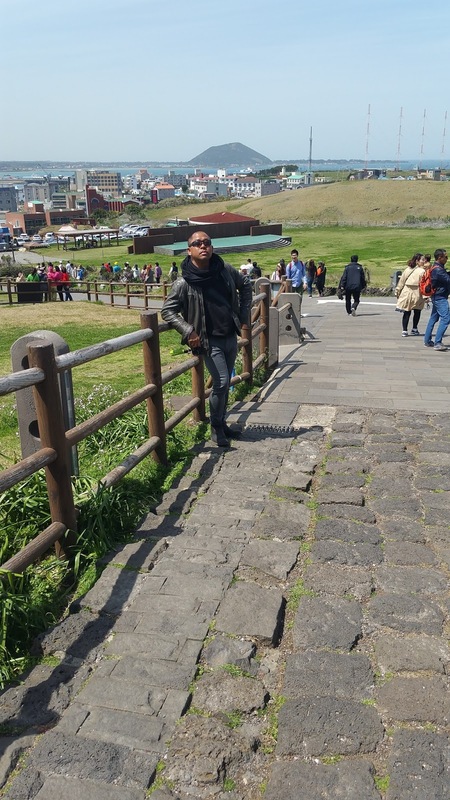 After all, it was our last day in South Korea. 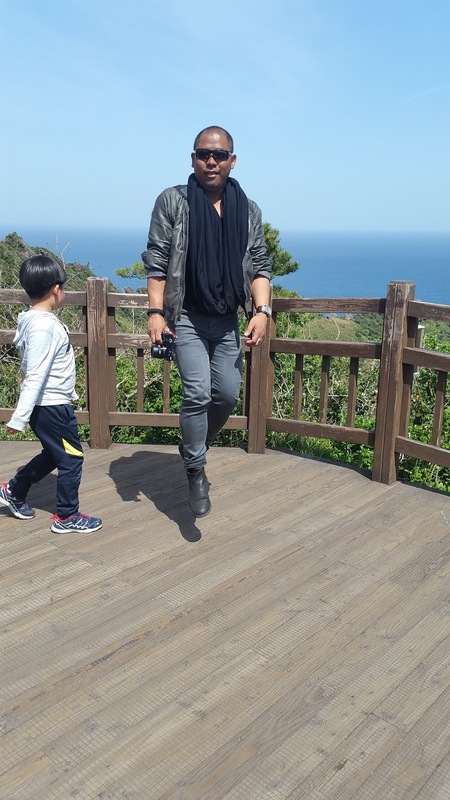 The next morning, we would already travel onwards to Hong Kong! 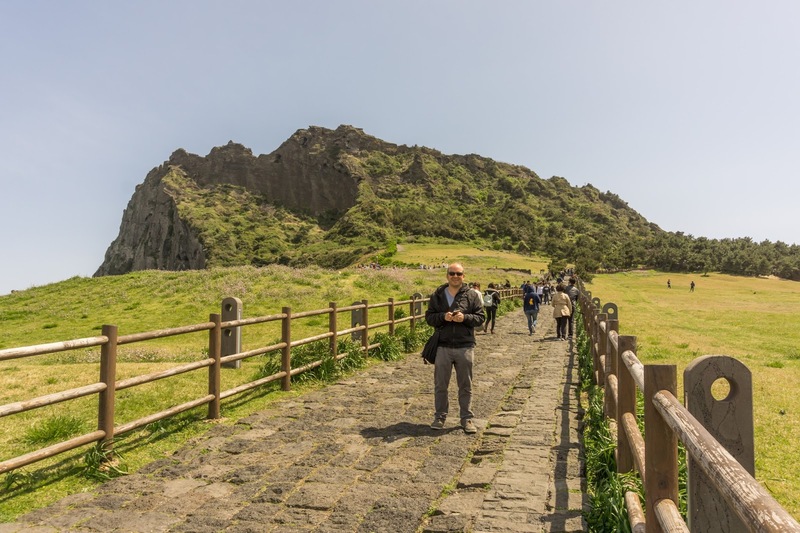 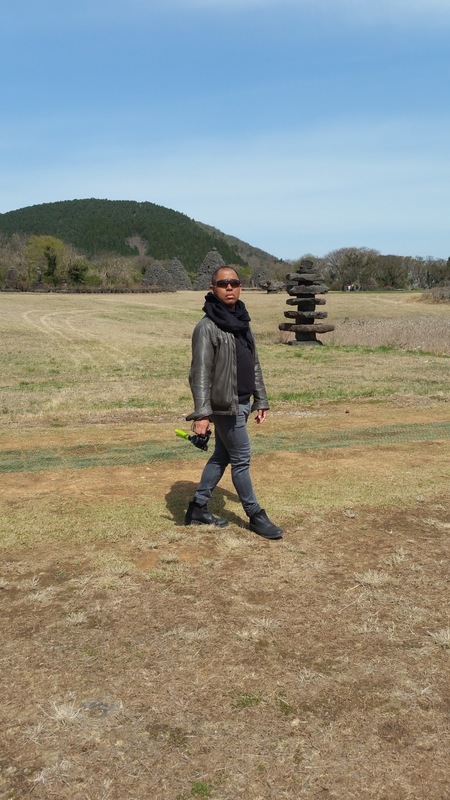 We could have easily spent some more days on Jeju Island and in South Korea. 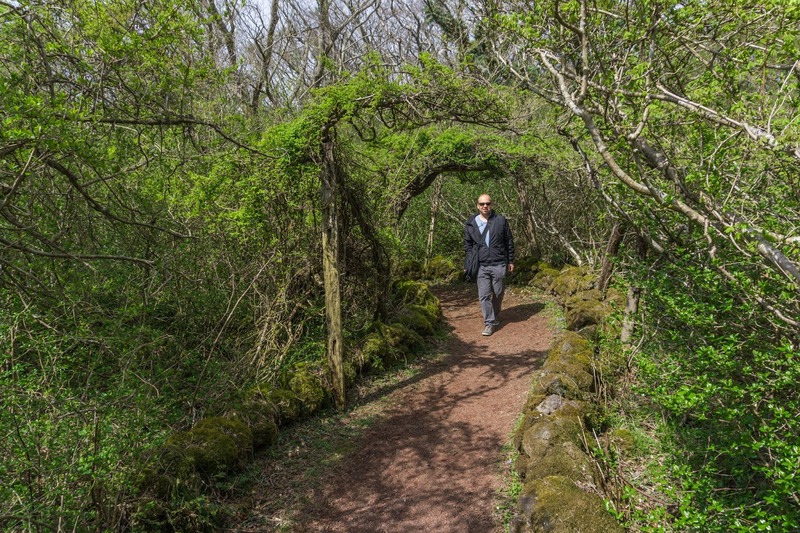 There's so much to explore!